Note: This post was inadvertently posted earlier than I had planned. The”Crostata” recipe, which was scheduled for Wednesday, will be delayed until next week. Thanks for your understanding. I really cannot recall just when I started making this dish. I do know it was around the time I moved here, to my current home, about 13 or 14 years ago. Being that I was tending bar at the time, in retrospect, finding another means of consuming alcohol of any kind doesn’t seem like the best of ideas. Still, regardless of when or why I started making this tomato sauce, it remains a favorite of mine, both for its simplicity and great taste. Basically, this is nothing more than a tomato sauce laced with cream and vodka. It really is that simple. Over the years, what began as a meatless dish has evolved and I now make it using prosciutto, although I have been known to serve it using ham, pancetta or even shrimp. You can pretty much use whatever protein you want and about the only thing you cannot skip is the vodka. Do that and all you’ve got is a marinara sauce with some cream added to it — not that there’s anything wrong with that. As for the brand of vodka to use, I opt for a higher quality brand, often “tasting” it first, in my kitchen, just to make sure that I’ve chosen wisely. Higher quality, however, doesn’t mean top shelf and I certainly will not be cooking with the highest quality vodka available. 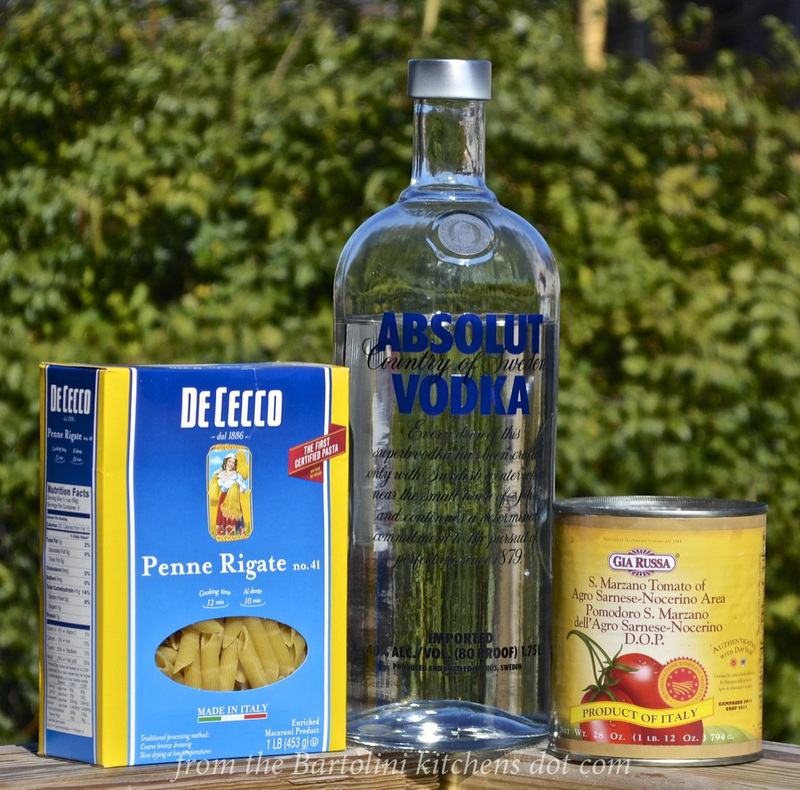 My basic rule of thumb is that if it’s good enough for my martini, it’s good enough for my pasta. Heat oil in a large, deep skillet over med-low heat. Add pork product and slowly render the fat. Do not cook until crisp. Increase heat to med-high. Add butter, then onion, and sauté until soft, about 5 minutes. If needed, add some olive oil. Remove pan from heat, add vodka, stir to combine, return to heat. Have a pan lid nearby to smother the flame should the vodka ignite. Allow to reduce for about 3 minutes. Add tomatoes, cream, parsley, season with salt and pepper, stir thoroughly, bring to a boil, and reduce to a low simmer. 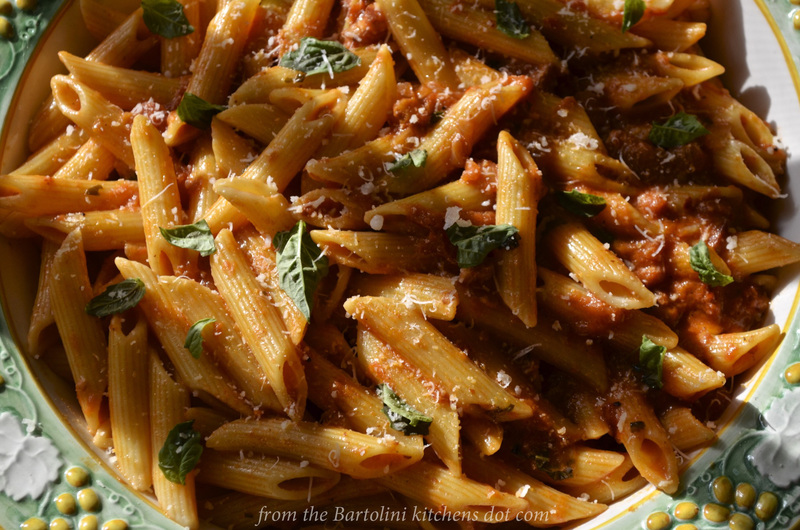 After sauce has simmered for 20 minutes, begin heating a large pot of salted water in which to cook the penne. Cook the pasta per package directions, cooking until about 2 minutes before al dente. Reserve a cup of the pasta water, strain the penne, and add the pasta to the tomato sauce. Continue cooking the combined pasta and sauce until the pasta is done to your liking. Add some of the reserved pasta water to the pan if the pasta becomes dry during this last step of the cooking process. Just before serving, add the basil, mix well, and garnish the serving platter with grated pecorino romano cheese. One needn’t use meat to make this dish and a pound of large shrimp, cut in half, is a worthy substitute. If you do use shrimp, however, add them to the sauce just before you add the pasta. The shrimp only need a couple of minutes to cook, during which the pasta should finish cooking. Remember: no cheese! She came. She saw. She conquered. The Visitation ended, far too quickly, and Zia is back in Michigan. While here, we met with family and friends, both near and far, new and old. We toured my favorite Italian and farmers markets and we dined out a couple of times, including our customary Friday night fish fry. This being Chicago, however, this fish fry took place at a sushi restaurant. Of course, I did cook and some of the recipes will make their way to this blog. All the while, incredibly, we were graced with some of the year’s best weather. All in all, it was a wonderful visit and I hope to import her again next year. Fingers crossed. 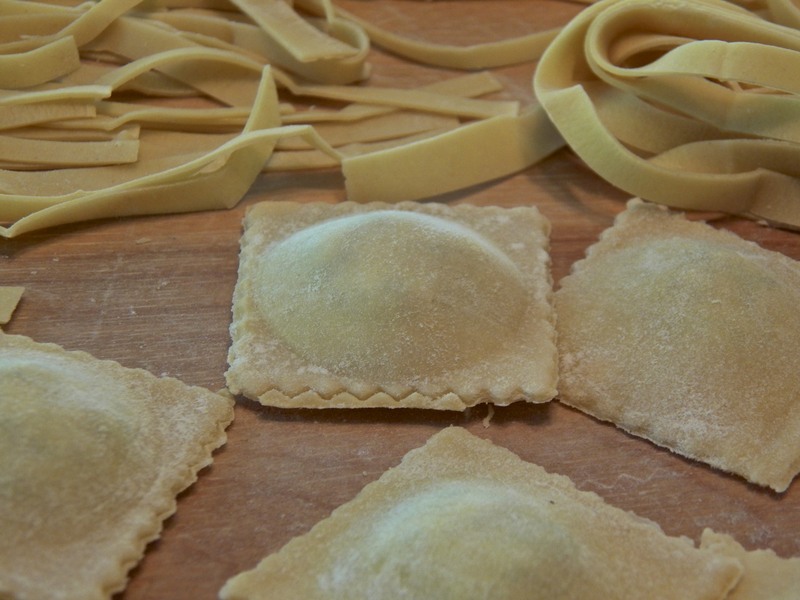 The making of ravioli has roots that go as far back as the 14th century in the North of the Italian peninsula and perhaps even earlier in Sicily. (Source: Wikipedia). Their creation involves a couple of axioms I’ve said many times before: nothing is wasted in a traditional Italian kitchen, and, meat was a dish reserved for holidays and special occasions. 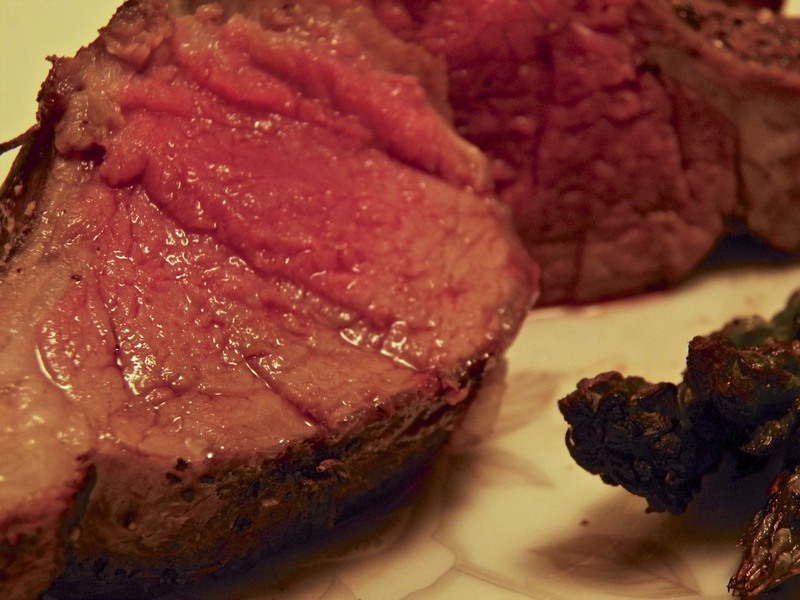 Well, when meat was served — and with no means of refrigeration — leftovers were a problem. Let’s face it: re-heating a piece of roast over a hearth isn’t necessarily the most appetizing means of dealing with leftovers. On the other hand, finely chopping the meat before adding it to, perhaps, a little cheese and some greens, and using the mixture to fill pasta “pockets” would make quite a tasty alternative. Not only that but a little bit of leftover meat would go a long way, far enough to feed the entire family. This was certainly the case when Zia and I were left with some roasted duck after our meal. We discussed how to use the leftovers and decided that making ravioli was the best way to go. I think we were pretty successful, as does my Zia. In fact, when we roasted a goat shoulder during my next visit, Zia set about making ravioli filling with the leftovers, as well. Frozen, it awaits my return so that we can make “goat” ravioli. The recipes for both the roast goat and the subsequent ravioli filling will be published soon. There is nothing complicated about our duck ravioli recipe, though the use of broccoli raab, rapini, requires a bit of blanching. How long depends upon your taste and whether you are fond of bitter greens. Blanching will remove some of the bitterness, as well as soften the vegetable’s “woody” stalks. Since we both do not mind rapini’s bitterness, we kept the blanching to a minimum. You, on the other hand, may wish to blanch the vegetable for a few minutes more and, therefore, boil away more of its bitter flavor. Melt butter in a large fry pan over medium heat. Add onions and stir to coat with the butter. Sauté for about 10 minutes, season lightly with salt and pepper, lower to med-low heat, and continue to cook, stirring frequently. You want the onions to brown but not burn. It may take from 30 minutes to an hour to be fully caramelized. Add a little bit of olive oil if the onions are too dry. Just before the onions are ready, deglaze the pan with a couple ounces of Marsala wine. The onions will be ready when the wine has evaporated. Once the onions have cooled, drain any excess liquids before placing them in a clean kitchen towel, wringing out as much moisture as possible. Meanwhile, bring a large pot of lightly salted water to the boil. Add the rapini and, once the boil returns, blanch the rapini for 5 minutes. Remove the rapini from the boiling water and immediately place the vegetable into an ice water bath. Once fully cooled, drain the rapini of as much liquid as possible before wringing in a clean kitchen towel. Use a meat grinder — or food processor — to grind the duck, caramelized onions, and blanched rapini. Add the Pecorino Romano and ricotta cheeses to the mince and stir well. Taste to check for seasoning before adding the egg. Stir till well-combined, cover, and refrigerate for a few hours or overnight. The filing is now ready to be used to make ravioli. 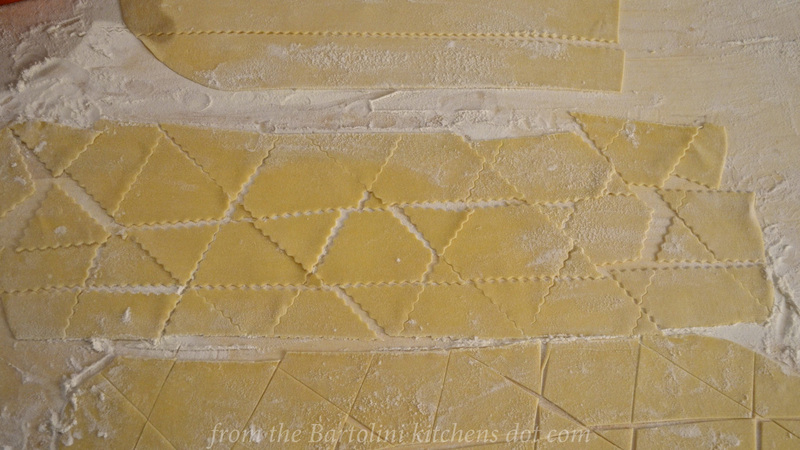 For step-by-step instructions for making ravioli using dies/molds, please check out my previous post for Ravioli dei Bartolini. 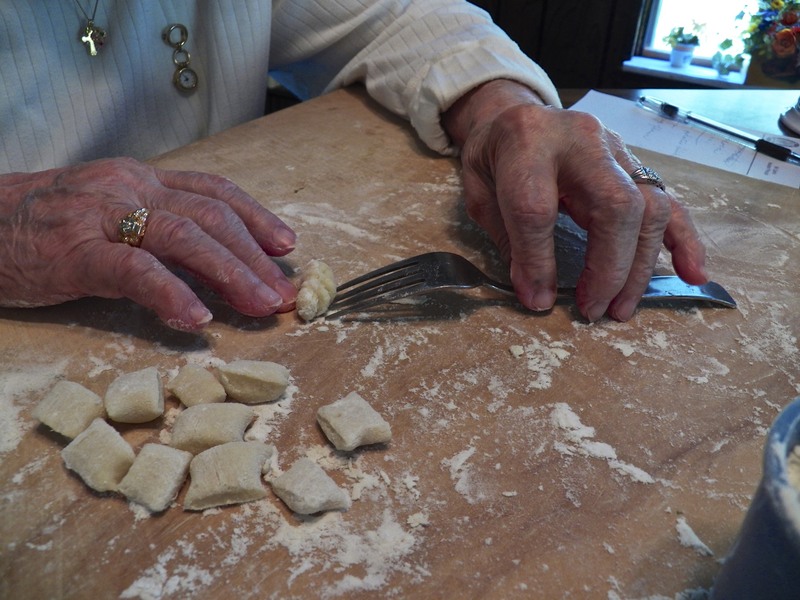 Here’s Mom’s Pasta Dough recipe, for those who need one. In this case, I substituted 3 duck eggs for the 4 large chicken eggs. 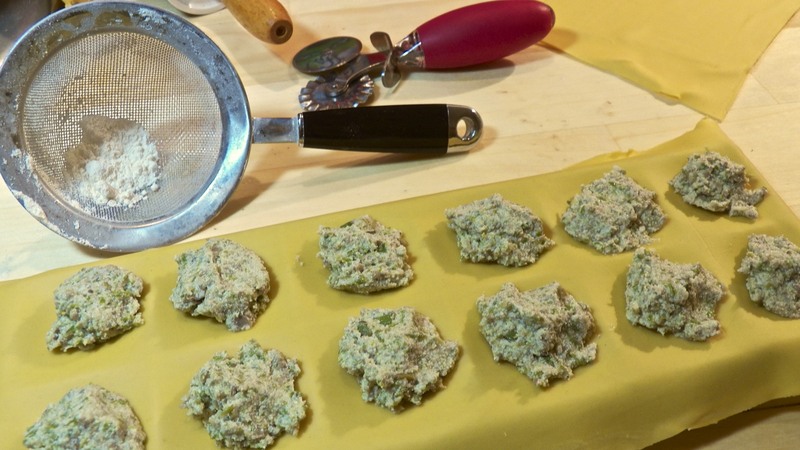 With today’s post dealing with a new edition to the Bartolini ravioli recipe collection, I thought a look back to the granddaddy of them all, the original Bartolini ravioli filling recipe, was in order. 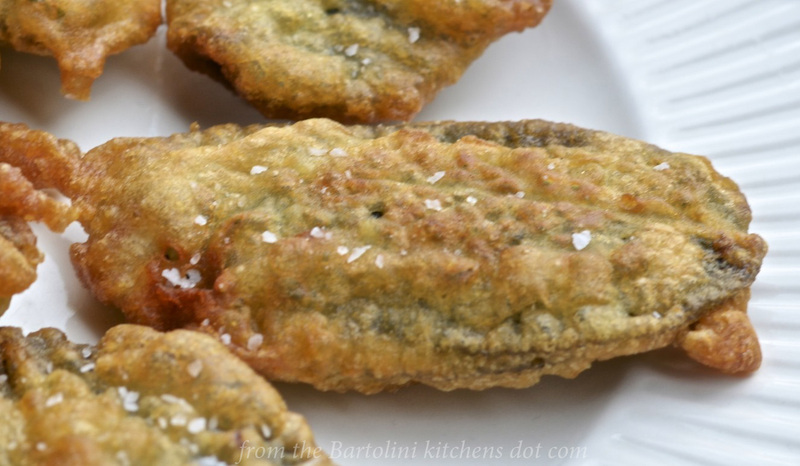 It’s still our favorite and the mere mention of it will cause any Bartolini clan member’s mouth to water, as his/her mind fills with memories of holidays past. You can learn all about it simply by clicking HERE. Now that’s a mouthful, isn’t it? I was talking about the title but the same applies to the dish. It’s one that I was served in Rome and I couldn’t wait to make it at home — but there was a problem. Although I’ve dressed pasta in this way, I didn’t own a chitarra, (guitar). No, I’ve not taken up an instrument during my time off. A chitarra is a piece of pasta making equipment that pre-dates the pasta machines common today. Abruzzo claims to be the instrument’s point of origin, believing it was developed there in the early 1800’s. A little larger than a shoe box, this chitarra has a number of strings evenly spaced on either side of a (removable) board. Each of the two sides creates a different pasta. Mine, for example, produces spaghetti and linguine. You place a dough strip on top of the strings and use a rolling-pin to score and form the pasta noodles. If they remain attached, a strum or two on the strings will cause them to fall to the board. Neat, huh? Unless, like me, you don’t own one. When I went to Italy, I had a couple of things in mind to bring back home, one of which was a chitarra. Although I did see a couple in the first days of my trip, they didn’t make the type of pasta I wanted nor did they seem very durable, particularly considering that my “souvenir” would be stuffed into a suitcase. Remember the American Tourister adverts? These chitarre would never have survived the trip home, even though my bag was, coincidentally, an American Tourister. Unfortunately, I never saw a chitarra again — and it’s not for lack of looking. In fact, my last morning in Rome was spent going to housewares shops looking for the pasta maker. 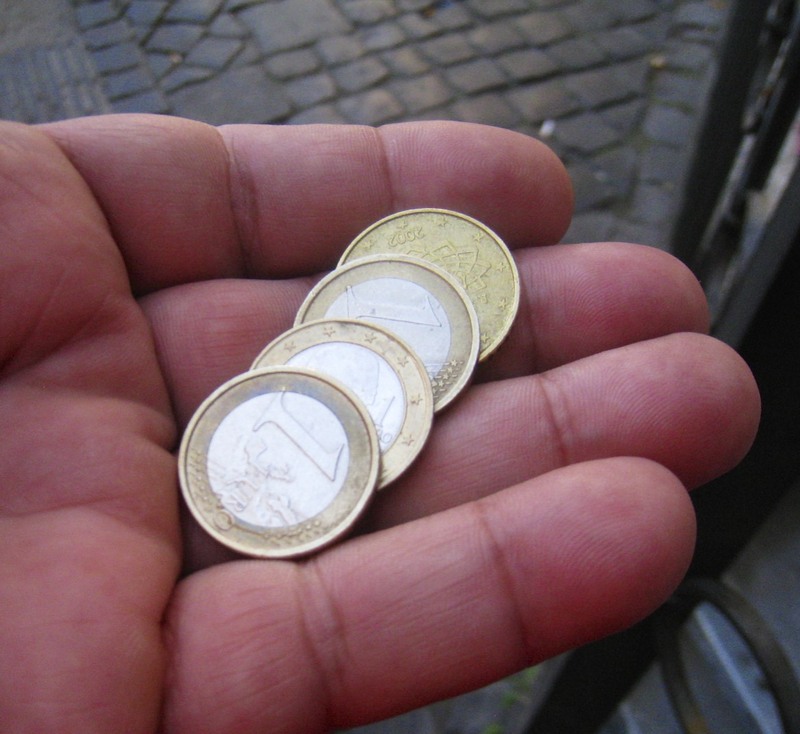 I finally gave up and, being near the Trevi Fountain, tossed in a few coins before treating myself to a peach gelato. Shopping is hard work, no matter the locale. Didn’t find a chitarra but the morning wasn’t a complete loss. The Trevi Fountain was fed. Though originating in Amatrice in the 18th century, this sugo is based upon one that pre-dates the arrival of tomatoes from America to the Italian peninsula. (That dish, Spaghetti alla Gricia, is another I enjoyed while in Rome and will be sharing the recipe in the weeks to come.) It wasn’t long before the dish traveled to Rome, where it was quickly adopted and has become one of the Eternal City’s “classic” dishes. 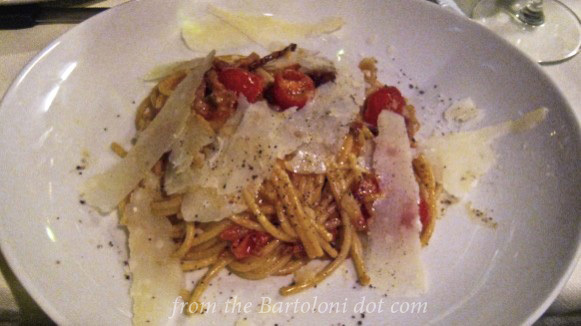 Today, Amatriciana is often used to dress bucatini, though not exclusively, as proven by my dinner that night. As you’ll soon see, it is one of the easiest tomato-based pasta sauces to prepare. Sugo all’Amatriciana, in its purest form, consists of 3 ingredients: guanciale, tomatoes, and Pecorino Romano cheese. Depending upon the amount of fat rendered from the guanciale, a little extra virgin olive oil may be required. Add a little salt and pepper and your sugo is ready to go. As you might imagine, there are variations. The pasta I was served contained a hint of garlic and a little heat from red pepper flakes. Onions were not used and, according to my waiter, they rarely, if ever, are. So there you have it. If you’re using homemade pasta, this dinner can be on the table in well under 30 minutes. In fact, it will take longer for the pasta water to boil than for any other part of the dish to be prepared. Meanwhile, heat guanciale in a large frying pan over medium heat. When all the guanciale’s fat is just about rendered, add red pepper flakes and a crushed clove of garlic, if using. Add a little olive oil if the pan is too dry. When the garlic is golden brown, remove and discard it. By this point, the guanciale should be cooked but not “to a crisp”. The pasta should be nearing completion. Add the tomatoes to the frying pan. Raise the heat to med-high. Reserve a cup of the pasta water before draining the pasta. Add the pasta to the frying pan, stir and cook all the ingredients together until the pasta is cooked al dente. If too dry, add some of the pasta water to compensate. 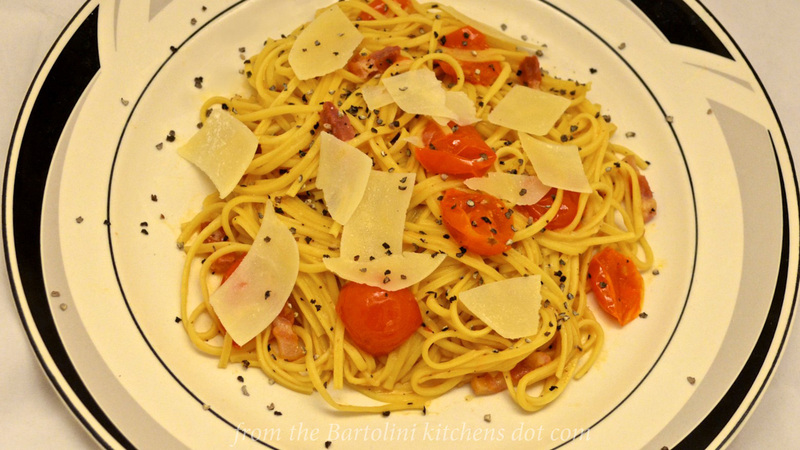 Turn off the heat, add a handful of grated Pecorino Romano cheese, and mix to combine. Add more pasta water if too dry. 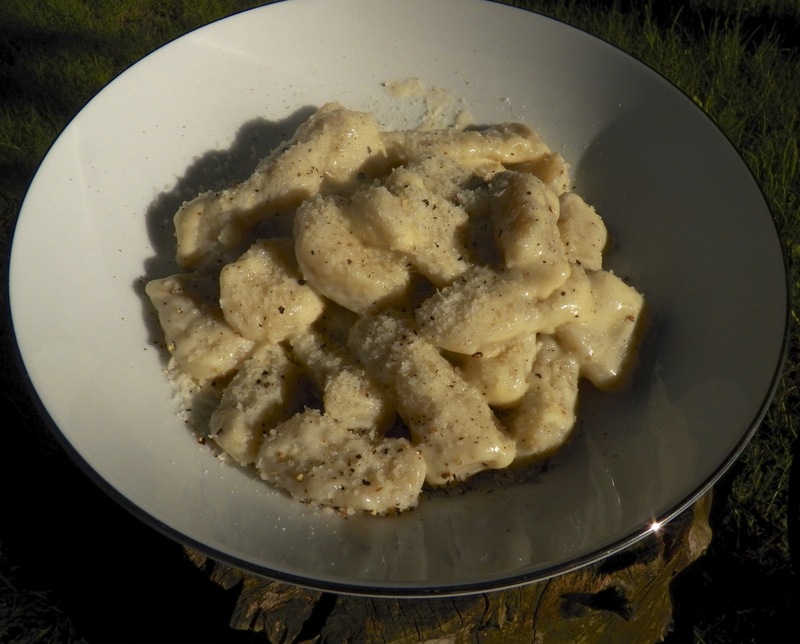 Serve immediately, garnished with more Pecorino Romano cheese and freshly cracked pepper. 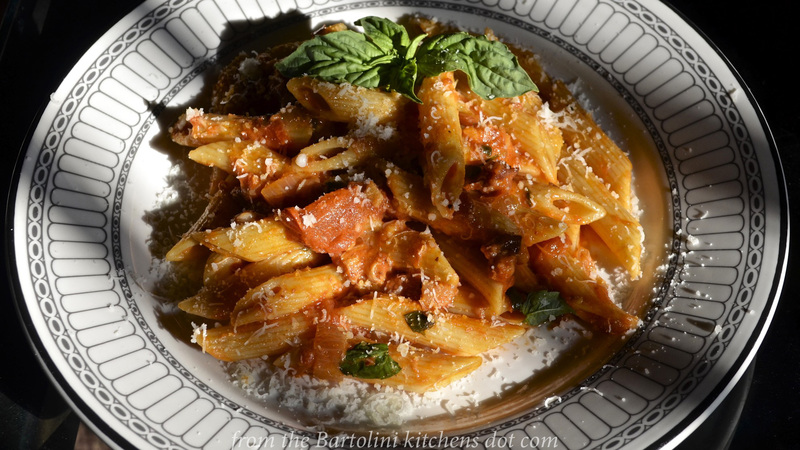 The most important issue when preparing pasta alla Amatriciana has to do with timing. If using freshly made pasta, as I did, the sugo will need to be almost fully cooked when the pasta is added to the water since the pasta will be ready in 2 to 3 minutes. If using store-bought or dried pasta, follow the package directions and drain the pasta when it is about 2 minutes shy of al dente. Although guanciale is preferred, not everyone can find this Italian pork product. Pancetta may be substituted, as can non-smoked bacon. As much as I love smoked bacon, its smoky flavor would overpower the rest of this simple dish. The dish I was served used halved cherry tomatoes. You could easily substitute one or two chopped fresh tomatoes, depending on the portions to be served. The City of Florence, West of the Arno River, as seen from the Piazzale di Michelangelo. On the left is the covered bridge, the Ponte Vecchio; in the center is the tower of the Palazzo Vecchio; further right are 2 domes, the smaller of which is the Basilica di San Lorenzo; and the remaining tower and dome belong to the Basilica di Santa Maria del Fiore, though known the World-over as Il Duomo. My favorite city in the World, Florence was the birthplace and heart of the Italian Renaissance, while the city itself is a masterpiece. The basilicas that dot the landscape were each designed by the finest architects of the time. The art collections of the Uffizi Gallery — once the offices of the Medici family — are among the World’s finest, while the Piazza della Signoria is like no other. Walking its streets, you can feel the history and easily imagine you’re in the 15th century, hurrying to meet friends in front of the Baptistery of St. John. You don’t see Florence, you experience it. I was the first to arrive at our flat, my friends were in transit from Sicily. This flat, too, had a terrace. To the South, we saw Il Duomo; to the North, San Lorenzo. Our days began and ended on that terrace. 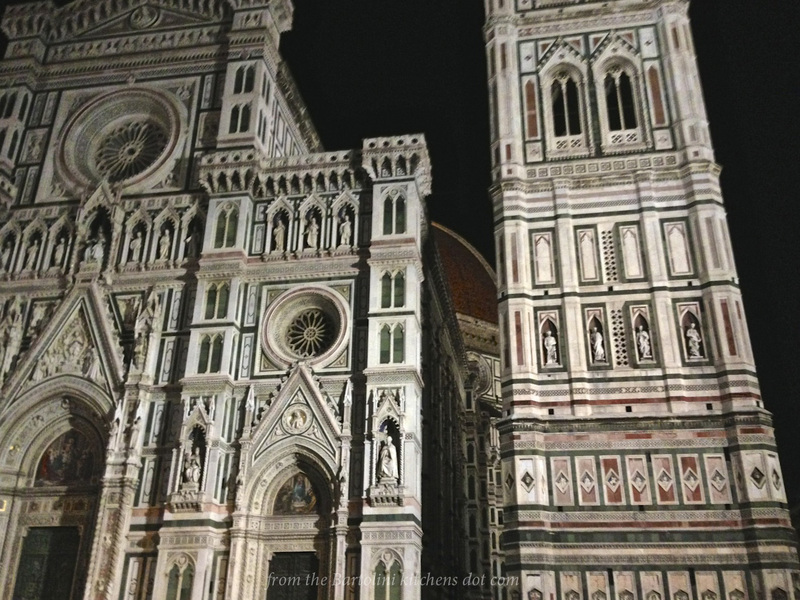 That there are so many large cathedrals in the Florence speaks volumes of its stature in Italy and all of Europe in the 15th and 16th centuries. Each, a thing of beauty in its own right, contains priceless works of art, not to mention the tombs of some very famous people. Above them all sits the Basilica di Santa Maria del Fiore, Il Duomo. Its external walls are made of 3 kinds of marble, each a different color — red, green, and white — and positioned in patterns composed of vertical and horizontal lines The cathedral’s magnificent dome was designed by famed architect, Brunelleschi. Just beyond its main entrance lies the Baptistery of St. John, the bronze doors of which, “The Gates of Paradise“, were designed by Ghiberti, The Basilica di San Lorenzo, also, features a dome designed by Brunelleschi though he died before its completion. This cathedral contains the tombs of members of the powerful Medici family. If it’s tombs you like, then you must visit the Basilica di Santa Croce. Within this beautiful cathedral’s walls you’ll find the tombs of Michelangelo, Galileo, and Machiavelli, to name a few. There are, also, funerary monuments for other famous Florentines, like Fermi and Dante. Don’t feel much like climbing a hill? Then stroll over to the Church of San Marco where you’ll find frescoes by the Renaissance artist, Fra Angelico. The Church, though, is only the starter. For the main course, head next door to the monastery, where Fra Angelico, himself a monk, and his students decorated each monk’s cell with a beautiful fresco upon which he could reflect and meditate. It is an incredible collection of early Renaissance works by a true Master. All that’s left, then, is the dessert. For that, head down the street to the Galerie de l’Académie, where you’ll find Michelangelo’s massive statue, “David”. A more satisfying meal cannot be served and there is still so much more of Florence to savor. Get ready for your first taste. Since I’ve spent so much time writing about cathedrals, I thought I’d share some photos of the Basilica of Santa Maria Novella, named “Novella”, New, because it was built upon the site of an earlier Church, Santa Maria delle Vigne. Completed in 1470, it is the first of the city’s great cathedrals to be built. In the center of the Cathedral hangs Giotto’s “Crucifix”, while its walls and side chapels, capelle, are decorated with frescoes created by some of the Renaissance’s most gifted artists. The sanctuary behind the awe-inspiring altar is called the Cappella Tornabuoni. The remarkably well-preserved frescoes decorating its walls were created by Ghirlandaio and his assistants, the most famous of which was a young Michelangelo. Stained Glass within the Tornabuoni Chapel. designed by Ghirlandaio but produced by Agolanti. Greek & Roman statuary line a Uffizi Gallery corridor. The City of Florence, East of the Arno River, as seen from the Piazzale di Michelangelo. To the left are remnants of the City’s walls with Galileo’s home just beyond the crest. If you look closely, you can see the dome of the Basilica of Santo Spirito, in the distance just to the left of the Arno River, beyond the Ponte Vecchio. There’s more Florence yet to come. Never mind our cool weather. It’s grilling season and here’s a way to cook fish on your barbecue without fear of the fillets sticking to the grates. Seasoned and enclosed in aluminum foil, you’d be hard-pressed to find an easier way to prepare fish. Oh! Did I mention how flavorful it is? Well, you can see three recipes for preparing fish in this way just by clicking HERE. The draft of today’s post has been waiting a couple of years to be posted. This is, in fact, the 4th intro that I’ve written for it. Something has come up to prevent its publication every time I’ve penciled it into my schedule. This, though, is definitely its time. 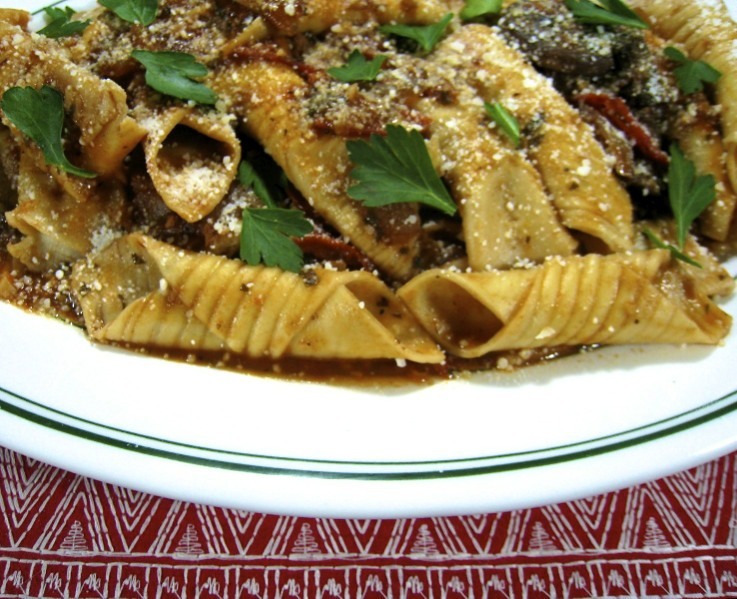 You see, I was “introduced” to garganelli while in Rome — twelve years ago with Zia. Rome was the last stop of our vacanza and I found a restaurant with the same name as that of my family’s surname. Mind you, it’s not like we have the Italian version of “Smith” or “Chang” as a surname — quite the contrary. Yet, there is a restaurant or trattoria with our name above the door in just about every city in Italy and in many major cities here, across The Pond, as well. Be that as it may, I noticed a dish of penne being delivered to a nearby table and, when the time came, mentioned to our waiter that I would like the same as my primo piatto. He politely pointed out that it was garganelli and not penne. I decided right then and there to learn how to make garganelli once I got home — and get my eyes checked. 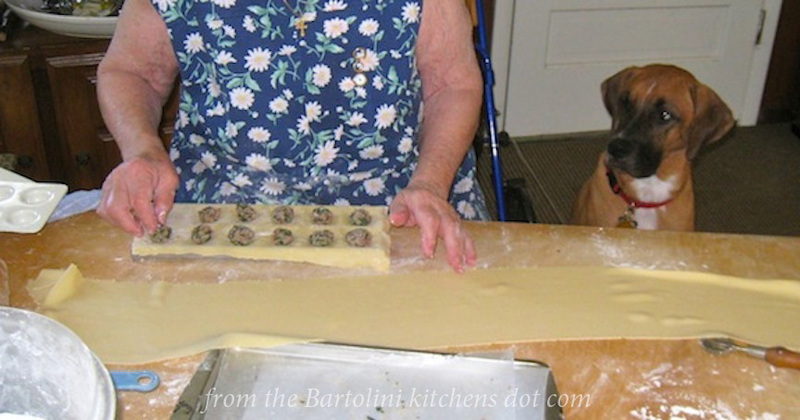 Not long after, I was back home making garganelli — but the story doesn’t end here. Last May, upon arrival to our flat in Rome, the owner went out of her way to make us feel at home, describing in detail each of the flat’s amenities. She was especially anxious to show us the terrace. With a view of the Colosseum, the dome of St. Peter’s, and the Vittorio Emmanuel II Monument, it was easy to see why she couldn’t wait to show it to us. When we returned from the terrace, she presented us with her own guide-book to Rome, paying particular attention to the flat’s locale. When we got to the page with her restaurant recommendations, the first on the list was a restaurant bearing my family’s surname. I thought it a coincidence — until we arrived there later that evening. The route looked so familiar, especially a long flight of stairs along the was very much like the one that had troubled Zia a dozen years before. Any lingering doubts I may have had vanished upon entering the establishment. This was, indeed, the same restaurant in which Zia and I dined and where I “discovered” garganelli. Surely, this was a sign that I should finally publish my garganelli post as soon as I returned to WordPress. Whereas it’s quite difficult to create perfect penne by hand, garganelli is very often handmade and has a “flap” where the pasta is joined to create the tube. Just like penne rigate, garganelli traditionally have ridges on each tube’s outer surface; the better to hold on to that rich tomato sauce. Now, you can search the web and you’ll find gadgets made just for putting ridges on your garganelli, but not me. Years ago, much to the amusement of Mom & Zia, I bought a gnocchi board that is used to put ridges on gnocchi. (In my defense, I needed a few more dollars in my order to qualify for free shipping and a gnocchi board was just the ticket.) As you’ll soon see below, and I was quick to point out to Zia, putting ridges on garganelli is yet another (of two) uses for this wonderful kitchen gadget. Now, don’t fret if you haven’t this nifty little gadget taking up space in a junk drawer. You can just as easily use the back of a fork, like you would when making gnocchi, or leave them smooth, like normal penne. No matter. Don’t let the absence of a few ridges cause you to miss out on this great tasting pasta! Begin by making a batch of Mom’s Pasta dough. That will give you 1.5 pounds (680 g) of dough. 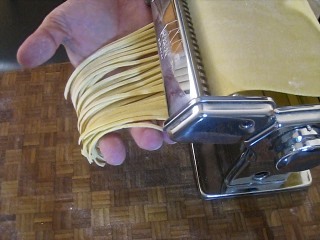 Roll the dough to a thickness of 6 or 7 on a pasta machine, where 1 is the widest setting. Pictures will tell the rest of the tale. Note: I use a straight edge here because I could neither cut nor draw a straight line if my life depended upon doing so. My garganelli have ridges, thanks to my gnocchi board! Some of you have requested that I post photos from my trip and I’m in the process of getting them all identified and organized. As you may well imagine, I’ve literally dozens of photos shot during my recent holiday and I intend to share some of the more memorable ones. Unfortunately, several dozen were “lost” when I tried to upload them to my iPad and the Cloud. (Ironically, I was uploading the photos to insure I wouldn’t lose them should I encounter a problem with one of my flash memory cards.) As a result, I have only a few pictures of Bologna and San Marino. Luckily, the photos of my family were spared, as they were on another flash card and I discovered the problem before I attempted to “save” them. I guess I’ll just have to go back to Italy so that I can re-shoot those pics. Bologna proved to be a wonderful start for my holiday. It’s an old city and there are plenty of medieval structures still remaining. At one time, some 180 towers reached for the skies, though only about 20 remain today. Of those, the Two Towers, Due Torri, are the most famous and dominate the city’s skyline. Walking about the city, you can’t help but notice that many of its walkways are covered, with columns forming the street-side “wall”. They’re a photographer’s dream, so long as you don’t botch the memory card upload. (Sigh.) As capital of Emilia-Romagna, Bologna offers the best foods of the district and, some would say, all of Italy. I certainly found no evidence to the contrary. I really enjoyed my time there and hope to return one day. I’ll be sure to stay longer, though, so that I can more fully explore the city. The covered walkways and their columns were everywhere, even on seldom used side streets. Another street and another covered walk. Bologna’s towers today, with Azinelli in the background, as seen from my hotel room window. It’s tart cherry season once again in my former home state of Michigan. Having a season of barely 3 weeks, now’s the time to head to the orchards and get your share. If you miss out, the best you’ll probably be able to do is to buy them canned or in jars. In the past, I’ve used them to bake pies and muffins, as well as to make jam. Click on each item to see its recipe. Today’s post is one of odds and ends, literally. Sure, there are two “recipes” to be shared but neither is deserving of its own post, both being incredibly easy to prepare. One, in fact, is traditionally nothing more than scraps, giving more proof to the adage that nothing is wasted in an Italian kitchen. Maltagliati is a pasta of irregular shapes, the name of which is derived from the Italian words for badly cut, male taglio. (Thanks, Francesca, of Almost Italian). It is the end pieces and leftover bits of pasta that result from a day of pasta making. Like snowflakes, no two pieces are alike, each being randomly cut. The fact that there would be enough scraps to prepare a dinner is an indication of the difference between our two countries’ eating habits. By one estimate, the average per capita consumption of pasta in Italy is 59 pounds per year, while in the US it’s only 19 pounds apiece annually. Yet we have an obesity epidemic. The reality is that a one pound package of pasta will yield 8 servings in most Italian kitchens. They will serve one such serving with most evening meals, the primo piatto. Here, we’ll get 5, 4, or even 3 mega-servings from a single pound. That serving is often the main course, with the addition of a salad, bread, and possibly a dessert. Most of our pasta is manufactured and store-bought. Up until recent times, the vast majority of pasta served in Italian homes was made by hand. If you make enough pasta so that everyone in your household is going to eat 59 pounds of pasta per year, you are bound to have a lot of scraps to deal with. Those scraps can become maltagliati and will be served in any number of ways, usually determined by the amount at hand. Very often, they’re served with beans, taking the place of the ditalini used in last week’s Pasta e Fagioli recipe. If you’ve plenty, they can be served with a hearty meat sauce, as was served to Zia and me one evening in Rome, where I first heard of this pasta. Here, I’ve chosen to serve them with a new version of pesto, simply because I needed a pasta narrative to accompany the recipe for today’s pesto. It would have been an incredibly short post, otherwise. 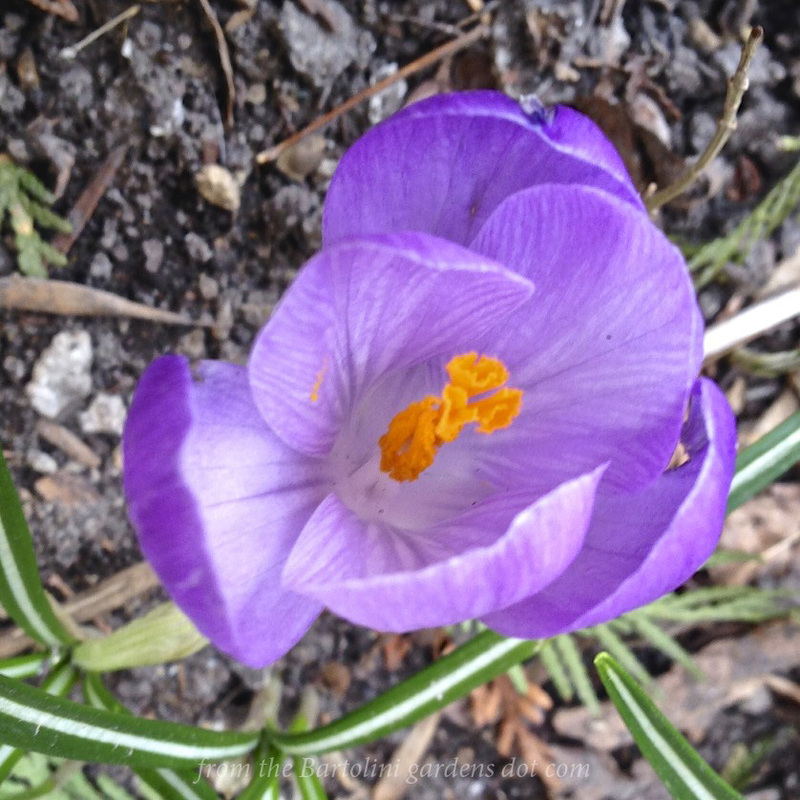 Yes, that’s the first, lonely crocus to bloom in my front garden. 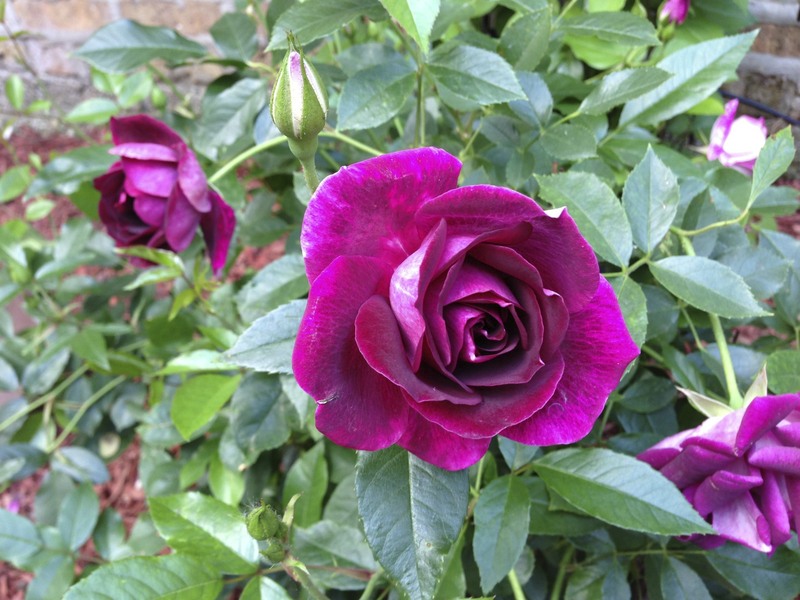 Spring is finally taking hold and with the new season comes an offer from my blogging friend, Mary, of Love – The Secret Ingredient. She is creating surprise boxes that will contain various gourmet items, small kitchen products, and recipes which will use the enclosed items. A box will be delivered every season and you can purchase them separately or all four at once. The part that caught my attention is that Mary will donate 10% of the annual profits to Feed The Children, an organization dedicated to providing hope and eliminating hunger. You can learn all about Mary’s Secret Ingredients by clicking HERE. Note: Although I’ve ordered and paid for a surprise box, I have not received any form of compensation for mentioning Mary’s offer. I saw this as an opportunity to help a fellow blogger and worthwhile charity at the same time. If you make a full recipe of Mom’s Pasta Dough, you will have about 1.5 pound (680 g) of pasta dough. That will make quite a bit of pasta, so, you may wish to halve the recipe or cut it into 3rds or 4ths. For this post, I cut the pasta recipe in half. 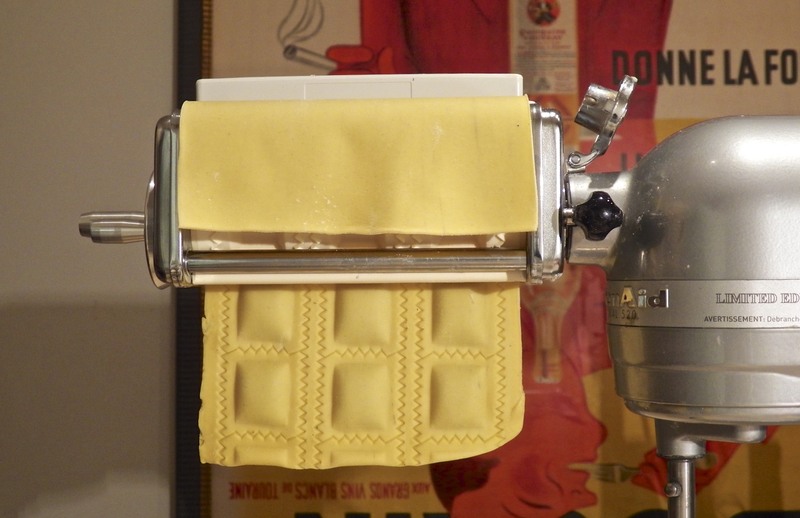 Take a portion of the dough and run it through the pasta machine rollers until it is as thin as you like. My rollers start at 1, the thickest setting, and I continue to roll the dough, up to and including the 6 setting. You may like your pasta thinner. If so, continue to advance the setting as you roll the dough. Lay the dough strip out flat on your work surface, dust lightly with flour, and allow to rest for a few minutes. Use a straight-edged pastry cutter to divide the strip into 3 equal strips. No need to worry about it being a perfect straight line. Just do the best you can. Do not separate them but leave them as-is. Place them in a single layer on a wax paper covered baking sheet that’s been lightly dusted with flour or corn meal. To cook, bring a large pot of heavily salted water to boil, add the maltagliati, stir, and allow to cook for a few minutes. Being freshly made, they should be fully cooked within minutes. Taste one when all have risen to the top of the pot of boiling water. Not everyone has time to make pasta, even when the process is as easy as this. Should that be the case, take some store-bought lasagna noodles and snap them. Just don’t get carried away, for it is easier to dine on larger pieces than tiny ones. Being flat, maltagliati have a tendency to stick together once drained, so, you must work fast. Once the pasta has been drained, quickly give it a light coating of olive oil before dressing it with the pesto. 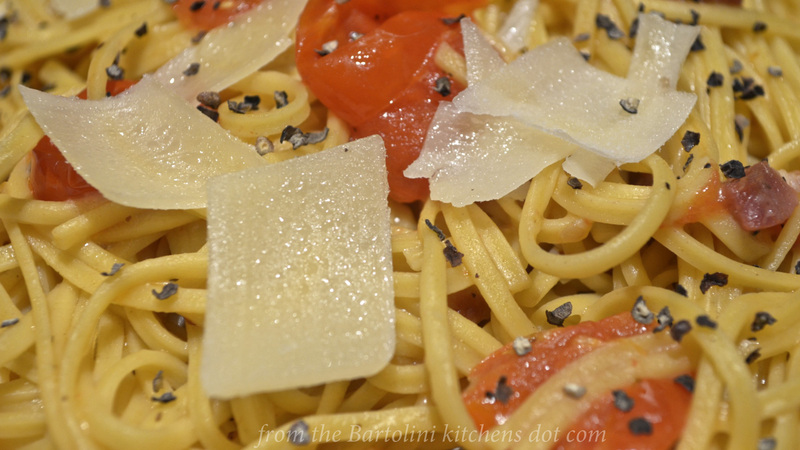 If using a red sauce, there’s no need for the olive oil but you still must quickly add it to the drained noodles. So, now that you’ve got a scrappy little pasta at your disposal, it’s time to dress it. Whether you’ve made pesto before, you shouldn’t have any problems preparing this recipe. Place everything but the olive oil, salt, and pepper in the bowl of a food processor. Let it process until a thick paste is formed. While the processor is still running, add the olive oil in a slow, steady stream until the pesto reaches the consistency you prefer. Taste and season with salt and pepper, as required. Pulse the processor to blend the seasonings with the pesto. Your pesto is ready for use. The reason for the odd amounts of basil and parsley is because of how both were purchased. I bought a 2 oz package of basil that, once the stems were removed, actually weighed 1.4 oz. Similarly, I bought a bunch of parsley that, once cleaned, weighed 1.1 oz. 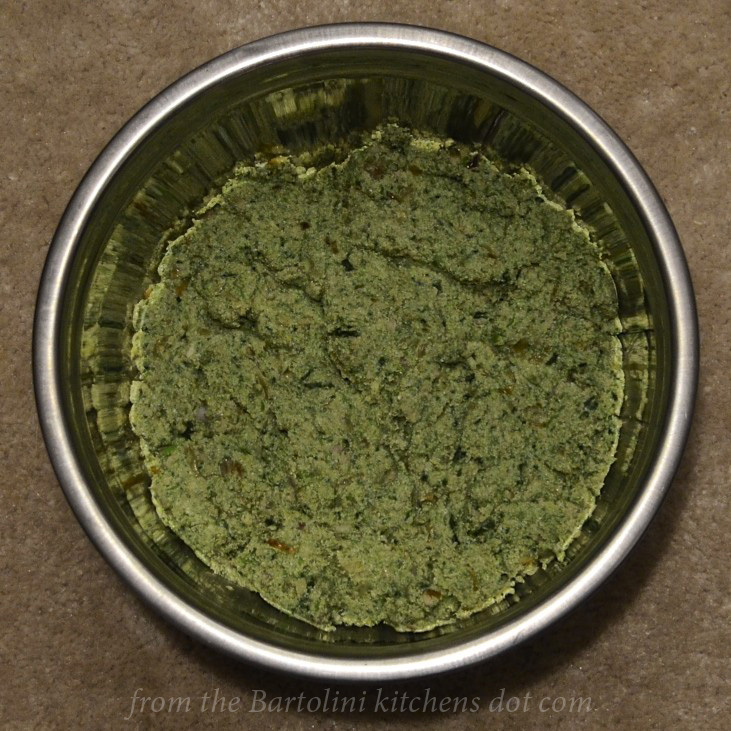 Traditionally, pesto is made using a mortar and pestle rather than a food processor. I do not own a mortar large enough to do this, so, I use a food processor. The fact that it is so much easier this way has nothing to do with it. I used my pesto recipe as the basis for today’s version. 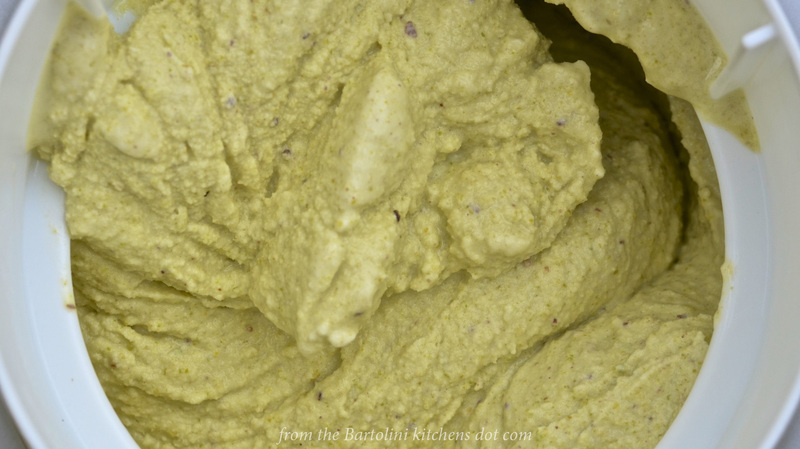 You can use your own pesto recipe, just be sure to replace 25 to 50% of the basil with parsley and, of course, use pistachio nuts instead of pine nuts. 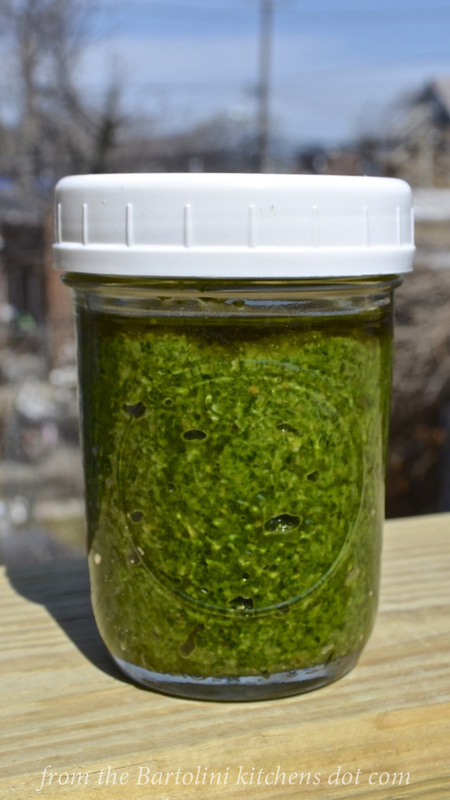 Refrigerate unused pesto in an airtight container, after topping with a thin coat of olive oil. Use it or freeze it within a few days. If I’m going to freeze this or any pesto, I do not add cheese to it while it’s being made. I’ve found that the cheese doesn’t thaw well and the pesto’s consistency suffers. Instead, I’ll add the cheese to the pasta when the pesto is added. If you have frozen pesto containing cheese, mix it with a bit of hot pasta water before using it to dress the pasta. The hot water will help make the pesto more smooth and easier to evenly coat the pasta. With lawns going green and last Fall’s bulbs breaking the ground’s surface, it can only mean one thing. It’s dandelion picking season! What you may consider a blight on your lawn, a Bartolini sees as a crisp salad. Click HERE to see the lengths traveled by my Dad to enlist our help picking the greens for our Sunday night dinner. Prior to the changes brought by Vatican Council II in the 1960′s, Christmas Eve was a “fast & abstain” day, meaning only 1 main meal could be consumed and no meat was to be eaten all day. For most Catholics around the World, it was a day of contemplation and that one meal was nothing special. With Christmas coming within hours, all eyes — and appetites — were focused on the big day — and dinner — soon to come. Not so the Italians. If tomorrow’s a big holiday and today you can only have one meal, why not make that meal special? And so they did. Can’t have any meat? No problem. With Italy being both peninsula and island, fish was very often more readily available than many meat products. And so it became a seafood banquet. Wait a minute! The Church may frown upon so grand a celebration on the eve of the birth of the Christ Child. Again, no problem. They made a point of serving seven fish, each one representing one of the Seven Sacraments of the Christian Faith. In one masterstroke, their seafood feast became an Act of Faith. What priest, bishop, or even Pope would dare interfere with these devout Catholics as they used the day’s only meal to commemorate the Seven Sacraments? (The fact that the clergy themselves were probably dining on an even more spectacular seafood supper didn’t hurt “the cause” either.) And so the Feast of the Seven Fishes was born and survives to this day wherever Italians call home. I first saw this dish prepared almost 20 years ago. An Italian chef, Nick Stellino, hosted a cooking show on PBS. That one episode not only showed me how to cook seafood pasta, Pasta dei Frutti di Mare, but it introduced me to the wonders of using parchment paper to envelope a dish. Since then, although I’ve made this dish a few times, I’ve made seafood pasta often and baked fish and/or vegetables in parchment or foil even more frequently. Now, this one dish will give you 5 of the 7 fish needed for your feast. Please resist the urge to go for broke and add 2 more fish to the pot. All that will do is muddle the flavors or, worse yet depending on the seafood chosen, completely overpower the others. If you’re looking for suggestions, how about oysters on a half-shell, a nice octopus salad, a small salad with seared tuna, or a bit of baccalà salad. 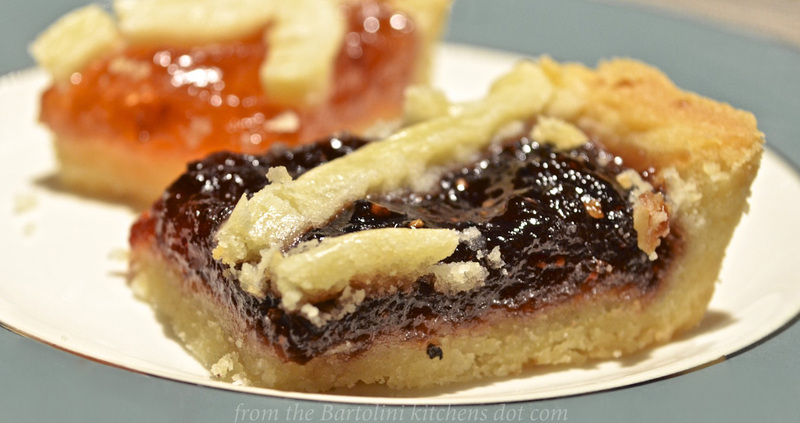 (A serving of baccalà in some fashion being the overwhelming choice of many Italian families.) Still not happy? Then do what I once did. Late one Christmas Eve afternoon, I was among the horde in a grocery store when I realized I was 2 fish shy of the required 7 for my own little feast. Not willing to spend any more time in the store while I weighed options, I went to the sushi counter and picked up a spicy tuna roll, before heading to the deli section to get a jar of pickled herring. Fish are fish, after all. At least 30 minutes before you are to begin preparing the sauce, place the clams in a bowl filled with cold water. Change the water at least once and be sure to brush the clam shells before cooking them. Place 2 tbsp olive oil in a small sauce pan over med-heat. Once hot, add the onion, the red pepper flakes, season with salt & pepper, and sauté until translucent, about 5 minutes. Add 2 cloves of garlic and 2 tbsp of parsley, stir, and continue to sauté for another minute or so. Add 1/4 c wine, the tomatoes, 1 tbsp basil, season with marjoram, salt & pepper, and bring to a boil before lowering heat to a simmer. Allow to simmer until sauce has deepened in color and thickened, about 30 to 40 minutes. Taste for seasoning and adjust, if necessary. Put aside 1/2 cup for the recipe and reserve the rest for another day. Pre-heat oven to 375˚ F (190˚ C). In a large, deep fry pan with a lid, add remaining olive oil over med-high heat. Add remaining oil, garlic, and parsley to the pan and sauté until fragrant, about a minute or so. Add the clams and mussels, cover the pan, and sauté for 2 minutes. Add the squid, shrimp, scallops, clam juice, tomato sauce, and the remaining basil and wine to the pan. Cover, increase the heat to high, and boil the ingredients for about 2 more minutes. By now, the pasta should be drained. Add it to the boiling sauce, stir to evenly coat, and sauté for a minute. Add the reserved seafood to the pan, mix, and heat till warmed throughout. At this point, discard any shellfish that have yet to open. Meanwhile, take a large piece of parchment paper — or aluminum foil — fold in half and place on a large serving platter. Use separate sheets of folded parchment paper, one per serving. Split the pasta and seafood evenly among the sheets. Garnish with parsley and basil. Fold each, as indicated in Step 11 above. Place the parchment packet(s) on a baking sheet and place in the middle of a pre-heated oven. Bake for 5 minutes and remove to a large serving platter or individual plates. Do not pierce the parchment until at the table. Serve immediately and watch as your dinner guests open their parchment presents and get a whiff of that steam. This is why you go through the trouble of putting seafood pasta in parchment. Do not serve with grated cheese for it will overpower rather than enhance most of the dish’s seafood components. If you are to prepare this on Christmas Eve, the last place you want to be that afternoon is standing in line at the fishmonger. Fresh seafood will easily keep in your fridge for 24 hours if treated properly. I would not recommend storing beyond 24 hours. Remove the clams and mussels from their packaging and place in a colander. Cover with damp — not sopping wet — paper towels. Place the colander in a bowl in which some ice as been set. Do not use so much ice that it will immerse any of the colander’s contents when it melts or the mollusks may drown. Place the bowl with colander into your refrigerator until needed. 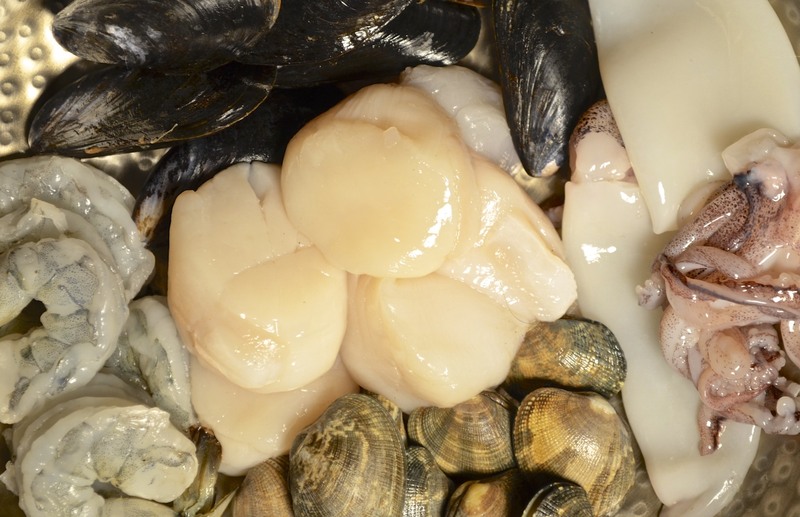 Leave the shrimp, squid, and mussels in their packaging and store in the coldest part of your refrigerator. Do not freeze. The Clams: At least 30 minutes before they are to be used in the recipe, place in a bowl of cold water and soak. (Some believe adding a couple tbsp of corn meal to the water will cause the clams to eliminate any sediment.) Change the water at least once before the clams are needed. Just before use, scrub clean the shells with a small brush. Discard any that are open and that won’t close on their own power. The Mussels: Before use, remove the beard (a thread mass on one side) and use a brush to clean the shells. Discard any that are open and that won’t close on their own power. The Shrimp: remove the shell including the tail section, if desired. Save the shells to be used to make shrimp stock. Use a sharp paring knife to slit the top of each shrimp. This will reveal a dark-colored vein that should be removed. The Scallops: these may be sold with a muscle attached to one side. It is about an inch long and /14 inch wide. This should be removed as it is tough and unpalatable. The Squid: Use a sharp knife to cut each tube, creating rings that are a half-inch wide. If using the tentacles, cut them in half or quarters. 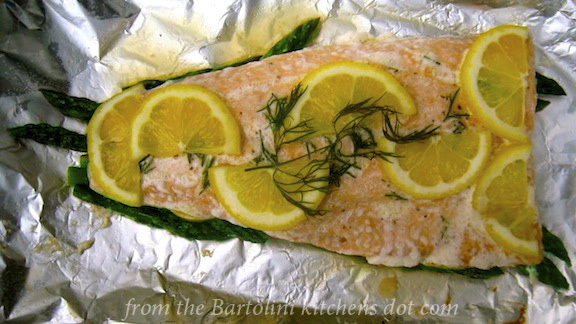 You may find it easier to enclose your seafood in aluminum foil rather than parchment paper. The choice is yours to make. Do not forget — as I did — to add a garnish of parsley and basil to each packet just before you seal them. Their presence adds to the aroma upon tearing the parchment. Timing is everything with this dish. The seafood cannot be kept waiting for the pasta to be cooked lest it become tough and rubbery. If you feel that you cannot properly time the dishes together, go ahead and cook the pasta so that it finishes within a few minutes of starting the sauce. Pasta should be cooked about 2 minutes shy of al dente, as indicated on the package’s instructions. Drain the pasta, return it to the now-empty pot, coat very lightly with olive oil, and cover until needed. You needn’t be an origami expert to fold and seal the parchment packets. That’s why the gods gave us staplers and don’t be afraid to use one. As written, this recipe will give you 3 nice servings. If you wish, it will yield 4 primo piatto-sized servings, though you may want to adjust the amounts of seafood used. The keen-eyed among you may have noticed that there seemed to be more seafood in the photos than was required by the recipe. You’d be correct. I usually buy a couple extra clams and mussels to account for any that may be spoiled and must be discarded. Not knowing that I had already done so, the fishmonger added a couple more, for the same reason. When I joked that the scallops looked “bad”, he agreed and added another 2 scallops to their previously weighed container. He then added 2 shrimp and another squid to their respective containers. This is how you earn life-long customers. 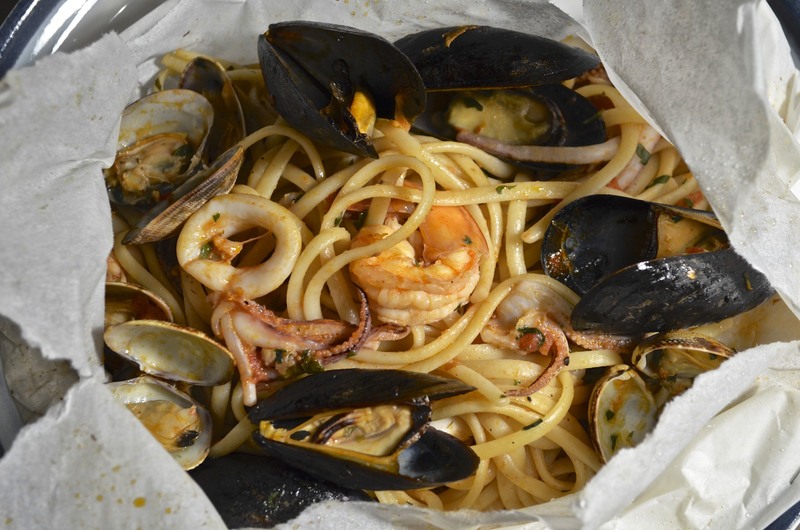 If you like, you can skip the parchment packets altogether and use this recipe to prepare a very good frutti di mare pasta. To do so, follow the recipe but cook the pasta for another minute before draining. Place the drained pasta into the sauce, as before, but cook it for only a minute before adding the seafood. Stir to combine, heat everything through, and serve immediately. Garnish with chopped parsley and basil. This dish does not make good leftovers. None of the seafood will re-heat well at all. Try to prepare just enough to ensure your dinner guests are satisfied without having anything left on the serving platter. As you may have noticed, I used a pastry brush to lightly coat the sealed parchment before placing it in the oven. There was no discernible effect to the parchment paper by doing this. Perhaps it’s because the oven temp was relatively low and the packet was in the oven so briefly. Whatever the reason, I won’t do it again for this recipe and excluded it from the recipe’s directions. 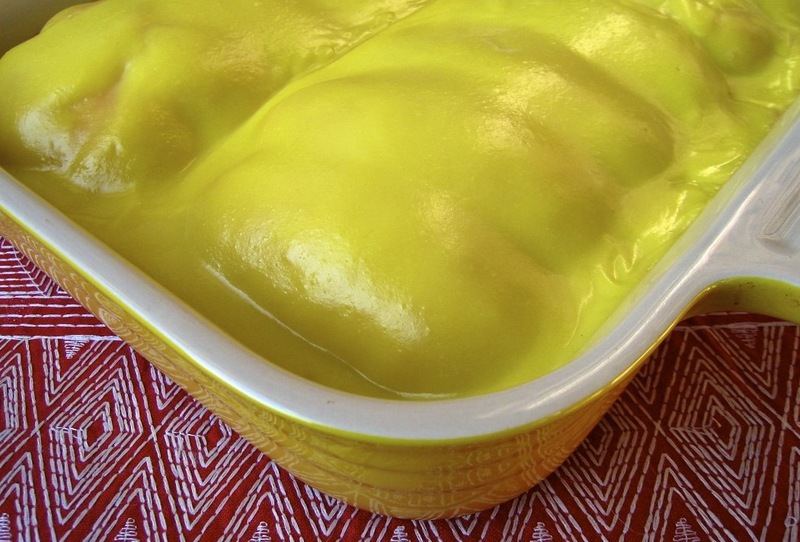 No series looking back at my family’s traditional Christmas dishes would be complete without including our recipe for Zuppa Inglesi. This highly anticipated dessert consisted of lady fingers that were “lightly flavored” with alcohol before being covered in lemon-flavored custard. There’s even an alcohol-free version so that no one seated at the table need go without. You can take a look at the recipe for this family favorite just by clicking HERE. Recently, our good friend Tanya, of Chica Andaluza fame, shared a recipe for Carpaccio of Octopus. (Do check out that recipe and, while you’re at it, take a few minutes to explore the rest of her fantastic blog.) I’d not thought about octopus in years and that post reminded me that my family once cooked octopus, polipo. I spoke to Zia about it and we decided to prepare it the next time I visited her. That visit took place last month and, with Monday having been Columbus Day, I thought octopus would make a fine way to commemorate his voyage across the Atlantic. After all, there were those that believed his ships would be sunk by a giant octopus long before they fell off the edge of the Earth. It’s been quite some time since an octopus was given the place of honor at a Bartolini dinner — more than half a century, but who’s counting? We really have no reason for it not being served since then. The dish is delicious, reminiscent of calamari in umido, and it isn’t at all difficult to prepare. No matter. The dish was prepared by my family at one time and thereby has earned a page on this blog. Back in the day, we would have prepared the octopus in umido, which in this case means stewed in a tomato sauce. Served in bowls with a chunk of good, crusty bread, the dish is delicious and, in some homes, is one of the dishes on the menu for the Feast of the Seven Fishes on Christmas Eve. Originally, I had planned to prepare today’s recipe in umido until reality intervened. pieces are far too small for in umido presentation. In fact, Zia and I attempted to serve them over polenta and, though tasty, all but a few pieces were too small even for that. On the other end of the spectrum, the market sells frozen octopi that are 4 and 5 lbs. apiece. Though that would be wonderful to prepare for a Bartolini family dinner, an octopus that size is far too large for a meal for Zia and I. So, although we had to change the dish to suit the circumstances, the search is on now for an octopus weighing 1 pound. When I find one, I’ll either create a separate Polipo in Umido post or amend this one to include that recipe. Bear in mind, though, that the ingredients used in the in umido recipe are the same as those used here for this sauce. Differences, if there are any, will be in the amounts listed. I’ll only be sure of that once I find an octopus in the right size. 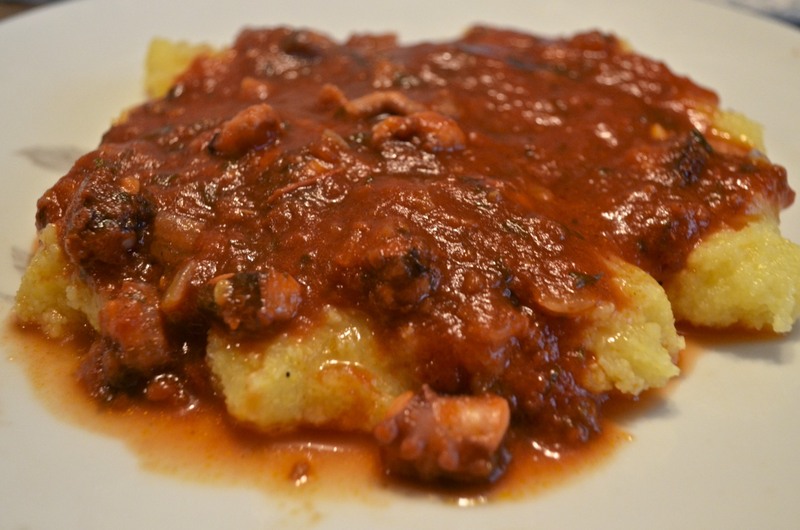 Since we couldn’t serve the octopus as we had originally intended, in umido, Zia and I served it over polenta. As I mentioned earlier, that dish didn’t quite work as well as we thought it would. Again the octopus pieces needed to be larger. Once home, I bought 3 more small octopi and decided to serve them over pasta. As luck would have it, a few weeks earlier my blogging friend, Lidia, had noticed something while shopping and sent her discovery to me. (Not only does she share the name of one of my favorite chefs, Lidia has a wonderful blog, Oh Lidia, and I hope you take time to have a look.) You can imagine my surprise when I opened the carton and found 3 pastas manufactured by a company called “Bartolini”. I can’t think of a better pasta to serve with this old family recipe than one that shares our family name. So, of the 3 sent, I chose to prepare strangozzi. In an earlier post, I demonstrated how to make strozzapreti pasta and gave an account of how it got its name. (See It’s déjà vu all over again … ) Strozzapreti, you see, means priest choker and one legend states that this pasta was so delicious that priests choked when eating it for the first time. What does this have to do with strangozzi? Well, it is thought that the word strangozzi is derived from the Italian word for shoelaces, stringhe, yet this pasta has come to mean priest stranglers. Huh? Stay with me. Centuries ago, in Umbria, the clergy was not looked upon kindly by the villagers. Legend says that they chased down the worst of the clergy and those that were caught were strangled with their shoelaces. 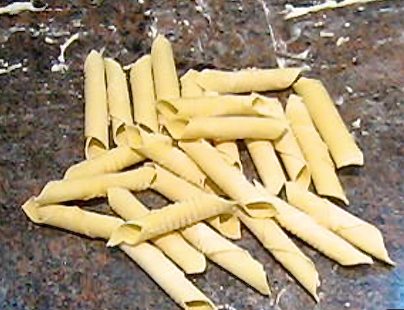 These long pasta ribbons are thought to resemble those shoelaces. Death by shoelace immortalized in pasta. Ya gotta love it! 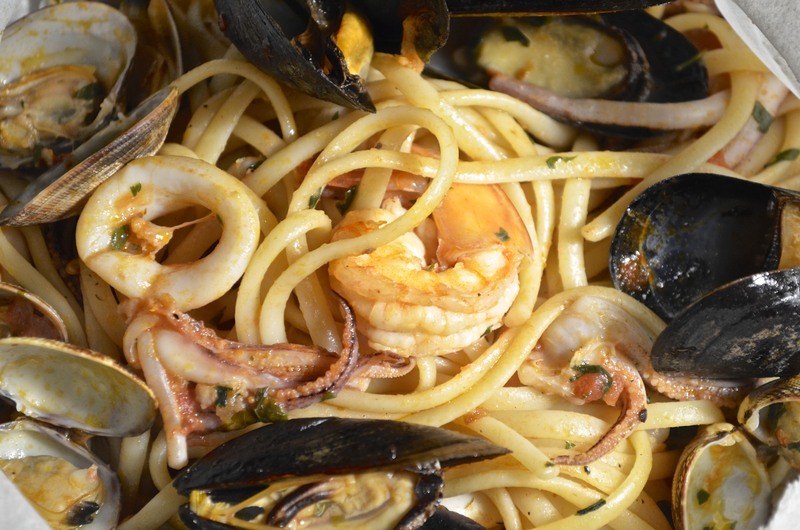 In reality, strangozzi are about the size of what we would call linguine, the only difference being in their thickness. 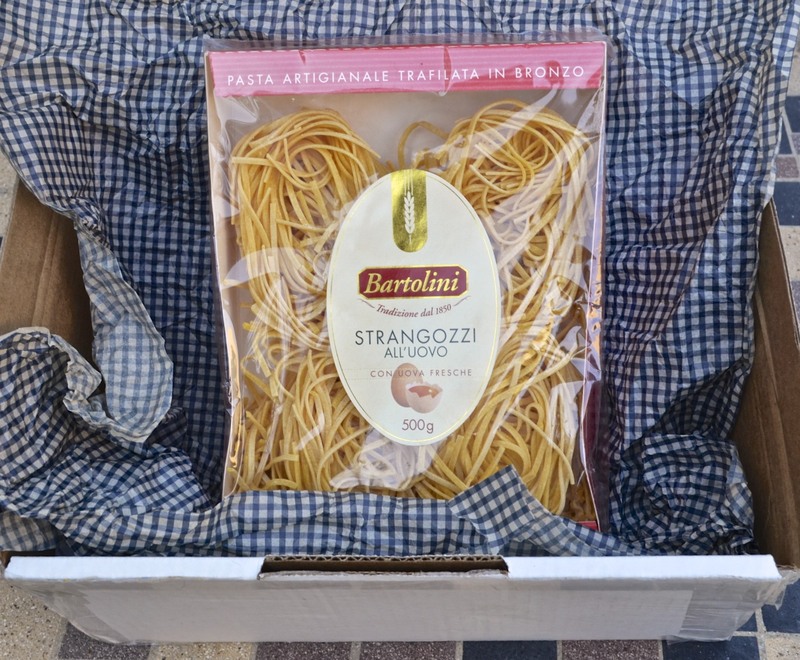 Our linguine are cut from thin pasta sheets; strangozzi is cut from sheets twice as thick. The result is a hearty pasta that is perfect for heavier or meat-based sauces. Before beginning the recipe, the octopus must be cleaned and readied. The head is actually a hood and the contents of its interior need to be removed. It is easy enough to do and you can slice its side to make it even easier. Next, the eyes must be removed. Make a small slice on either side of each eye, creating a small wedge. Remove each wedge and the eye with it. Since these octopi were so small, I sliced the octopus just above both eyes and again below, creating a ring. I then cut the eyes off of the ring. One last thing to be removed is the beak. Turning the octopus upside-down, you’ll notice a small whole at the center of the 8 legs. With your fingers, carefully feel the beak and note its size. With a sharp knife, cut around the beak and remove. Now that it’s cleaned, cut the legs section in half, creating 2 parts with 4 legs apiece. Cut those pieces in half again, and then again. In the end, you will have separated all 8 legs. Do not chop them but leave them whole and proceed with the recipe. Click to see any/all photos enlarged. In a medium saucepan over med-high heat, bring to boil enough water to cover the octopus. Add the octopus and allow to simmer for 1 to 2 minutes after the pot returns to the boil. Small octopus should boil for 1 minute. Larger should be allowed to boil closer to 2 minutes. Remove the octopus and place in an ice bath to stop the cooking process and reserve. Once cooled, see Notes for chopping considerations. Over med-high heat, add olive oil in a medium sauce pan. Add red pepper flakes, onion, garlic, and parsley. Season with salt and pepper before sautéing until the onion is translucent and garlic fragrant — about 6 to 8 minutes. Add the tomatoes, wine, and marjoram, stir to combine. Bring to a boil before reducing to a soft simmer. After the sauce has thickened and darkened a bit — about 30 minutes — add the chopped octopus and continue to simmer. Meanwhile, the pasta should have been cooked al dente and strained. Be sure to reserve some of the pasta water. In a large bowl or serving platter, combine the octopus sauce with the cooked pasta and mix. If the pasta seems too dry, add some of the reserved pasta water. Like all mildly flavored seafood pastas, grated cheese is not recommended for it will overpower the dish. The dish will determine the size of the pieces when chopping the octopus. 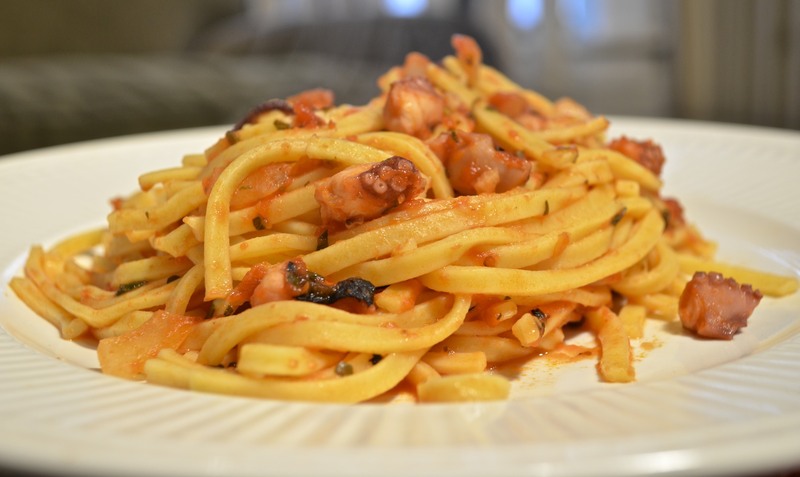 For pasta dishes, I would suggest chopping small octopi into pieces about 3/4 inches (2 cm). These pieces will shrink a little during cooking and will be easily managed no matter what pasta you choose. No matter the preparation or the size of the pieces, do try to keep them all the same size. Doing so will ensure that all the octopus is evenly cooked. Understandably, the larger the octopus, the longer it should simmer in the tomato sauce. A small octopus should take 15 to 20 minutes, as was stated in the recipe above. Larger octopi will take up to 30 minutes, maybe more. Be careful not to overcook lest the octopus become rubbery. If in doubt, taste a piece to see if it is cooked to your liking. For reasons unknown to me, we’ve always discarded the water used to blanch the octopus. Even though the octopus is in it only briefly, the water does darken in color. With all of this talk of strangling priests, it’s only logical that today’s look back would be to the strozzapreti post. Not only will you learn how to make the pasta by hand, you’ll also learn how a few of the common pastas got their names. All this can be yours just by clicking HERE. It happens every Spring. After having spent the Winter avoiding most fresh vegetables because they’ve seemingly spent more time in transit than in some distant fields, the farmers markets open and I can barely contain myself. I go with a general idea of what I’d like to buy and return home with two bags full of produce and a loaf of bread. As I unpack Saturday’s harvest, I begin to plan my meals. In the past, I’ve commented on a couple of blogs that I’m amazed at how we all could look at the same ingredients and “see” different dishes. Nazneen, for example, could take these ingredients and have no trouble creating a tasty pullao. BAM, on the other hand, could easily prepare a flavorful GF stir fry. Then, of course, there’s Katherine and Greg. Heaven only knows the dish they’d create but I guarantee it would be delicious and I wouldn’t be the only one to bookmark the recipe. Me? Every week I break out the flour and start making pasta. The only question in my mind is what vegetables to use for which pasta. And when all is said and done, on Thursday or Friday night, I use leftovers and whatever vegetables remain to make a fresh egg frittata. Come Saturday, with a newly cleaned-out refrigerator, I head back to the market and start the process all over again. 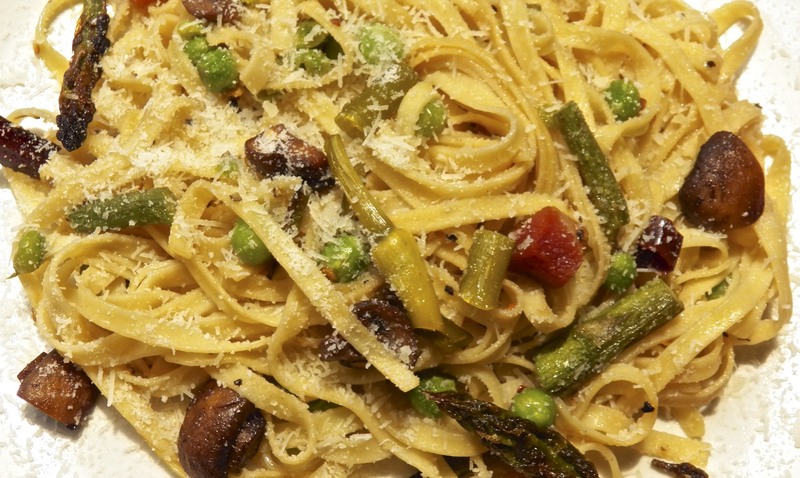 Today’s recipe is one of these farmers market pastas. Primavera is the Italian word for Spring. 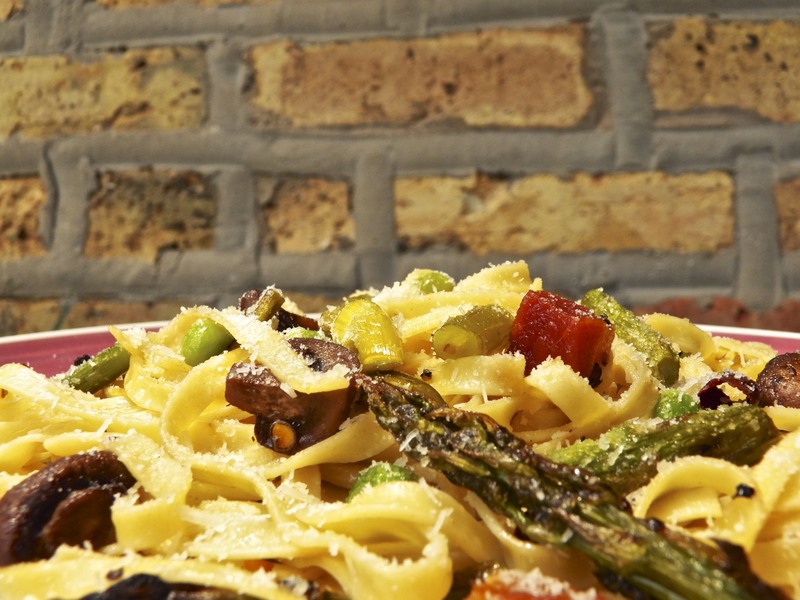 Pasta Primavera is a dish that celebrates the freshest of ingredients. It is a true marriage of flavors, with no single taste dominating the rest. To dress the pasta, the “sauce” can be cream-based, oil or butter-based, and even include tomatoes. In short, a pasta primavera can be whatever you would like it to be, so long as the ingredients are fresh. For today’s recipe, I rendered some guanciale and used the resulting fat as the base of my sauce. Since I was adding scapes, there was no need for garlic but I did add a couple dried red peperoncini to add some heat to the dish. Beyond that, fresh peas, asparagus, and a few mushrooms were added, with a splash of white wine to round out the dish. And just to make sure that they didn’t get “lost”, I grilled the scapes and asparagus spears before adding them to the pasta. Then, after adding a sprinkle of cheese, dinner was served. And to my fellow Americans, have a happy and safe 4th of July. 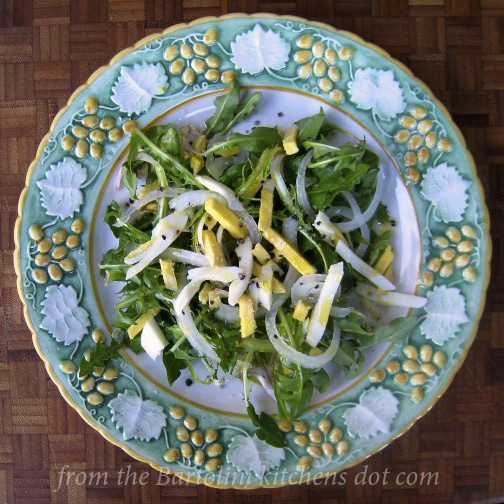 Pecorino Romano cheese, grated, for serving — Parmigiano Reggiano can be substituted. 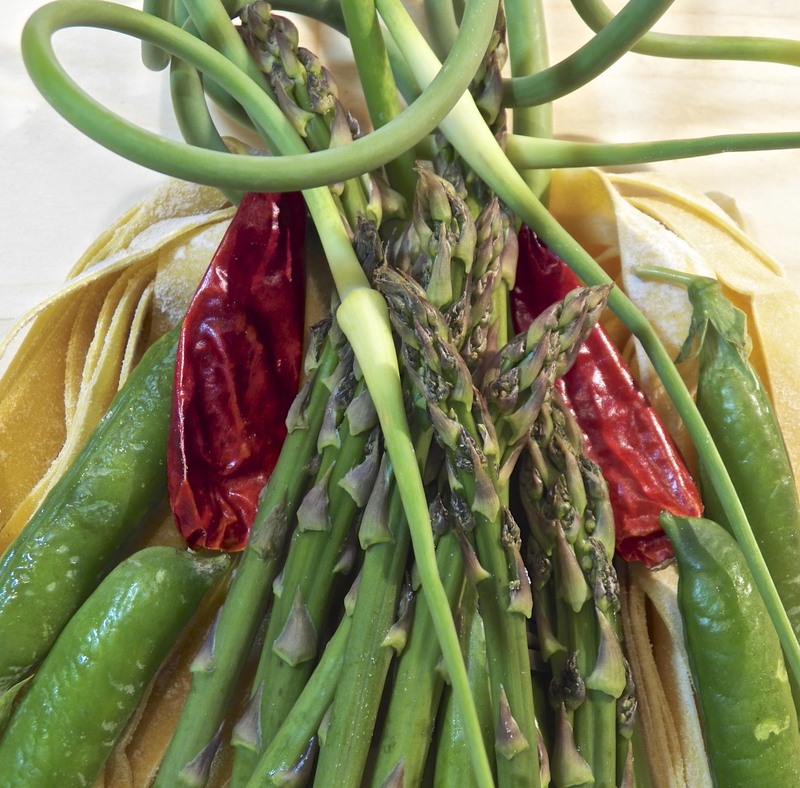 Place the scapes and asparagus atop the hot grill surface. Cook each vegetable to your liking before removing from heat. When cool, roughly chop both vegetables. Meanwhile, bring a large pot of salted water to the boil. Add the guanciale to a large frying pan over med-high heat. Continue to cook until the fat has rendered and the guanciale is not quite fully cooked. Crumble the dried peperoncini by hand before adding to the pan. Add the mushrooms and continue to sauté for a few minutes. Lower the heat to medium, add a couple of ounces of wine and the peas. Continue to sauté. Time the pasta to be just shy of al dente at about the time that the peas are cooked to your satisfaction. Drain the pasta, reserving a cup of the pasta water, and add the pasta to the frying pan. Add the chopped scapes and asparagus, mix well, and continue to cook until the pasta has reached al dente. Add pasta water if the pan’s contents are too dry. Remove to a serving platter, garnish with grated cheese, and serve. Be careful not to use too much guanciale. If you do, the taste will become predominant and you’ll be unable to taste much else. I’ve made that mistake and although it is still a very flavorful pasta, it’s also a waste of garlic scapes. I like a little heat in the dish so I crumbled 2 dried peperoncini that came from the heart of Italy’s peperoncini region, Calabria. You could easily substitute red pepper flakes or skip them entirely, if you like. Before using the scapes, I trim an inch or two off the bottom of each scape and, because they can get hard and unpalatable when grilled, I trim off each top just above the flower bulge. I used 3/4 lbs. of trenette pasta because that’s the amount of dough I had left over when I made last week’s ravioli. Use as much, or as little, pasta as you like. The same holds true for the rest of the ingredients. As the Summer progresses the ingredients will change to include broccoli, chard, cauliflower, and/or whatever else catches my eye as I walk around the market. You can and should do the same with your pasta primavera. I have an attachment for my pasta machine that will cut trenette pasta. Used throughout Genoa and Liguria, trenette — not to be confused with trennette — are one of the flat, “ribbon” pastas, this one being about “a silly millimeter thinner” than linguine. Although trenette is traditionally dressed with Pesto Genovese, I like the pasta because it most closely resembles the pasta Mom & Zia cut by hand when I was a boy. I can almost hear Mom’s knife as she quickly cut the rolled sheet of pasta, sfoglia, all the while having a conversation with whomever was in the room or seated at the table. The speed of that blade was truly a marvel, at a rate easily 5 or 6 times my best. And the noodles were all uniformly cut, something I cannot do even when working at a snail’s pace. So I cheated. I bought myself a trenette pasta machine attachment — and one for Zia — and now we can enjoy a dish of pasta just like back in the day. When this year’s seedlings didn’t fare so well, I bought heirloom tomato plants from the farmers market. Lo and behold! 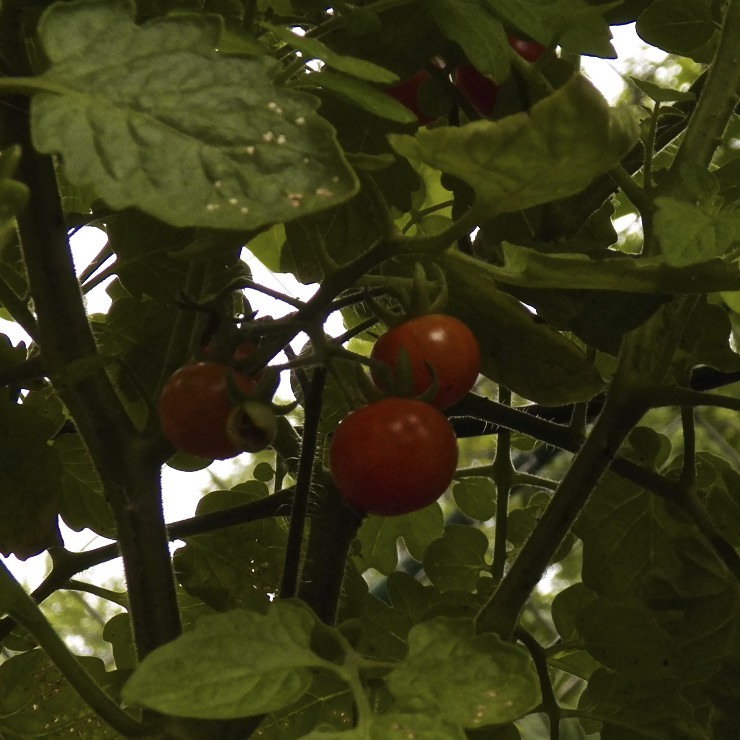 For the first time in years, I’ll be eating home-grown tomatoes, even if only the tiniest of cherries, on the 4th of July. Lucky for us, all is not vegetable at the markets. We are now in cherry season and this year I’m twice blessed. Not only are Michigan’s tart cherries hitting the markets but I’ve a friend that surprised me with enough cherries to make a fantastic pie. Now, I can eat sweet Bing cherries by the fistful but these tart red beauties are meant for pies, muffins, and jam. Pictured on the right is a bit of the pie I made with my friend’s gift. You can see the recipe I followed by clicking HERE. Yes, it’s another ravioli filling recipe, though not the one I had originally intended to post. Today’s filling recipe was to include ramps, a dish Zia and I developed during my last visit home. Well, ramp season has passed and I doubt that any of the wild onions are to be found anywhere. Asparagus, on the other hand, is still around, though it’s numbers have greatly decreased over the last 2 weekends. (The ramps post is written and will be published soon.) Seeing that asparagus season is also fleeting, I thought it best to post a recipe using the spears now, while you can still get some that are locally grown. 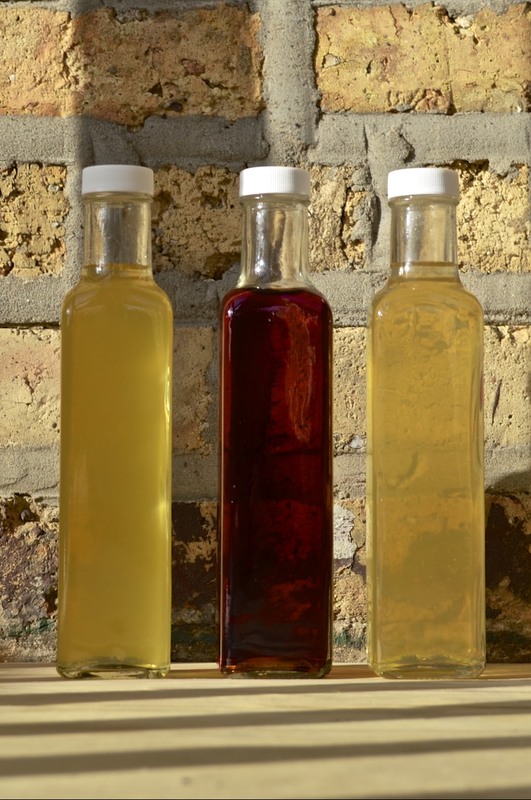 In fact, all 3 recipes presented in today’s post will take advantage of the current harvest. The “Déjà vu” recipe will feature strawberries, while “Coming soon” is a pasta recipe that includes a number of fresh ingredients. 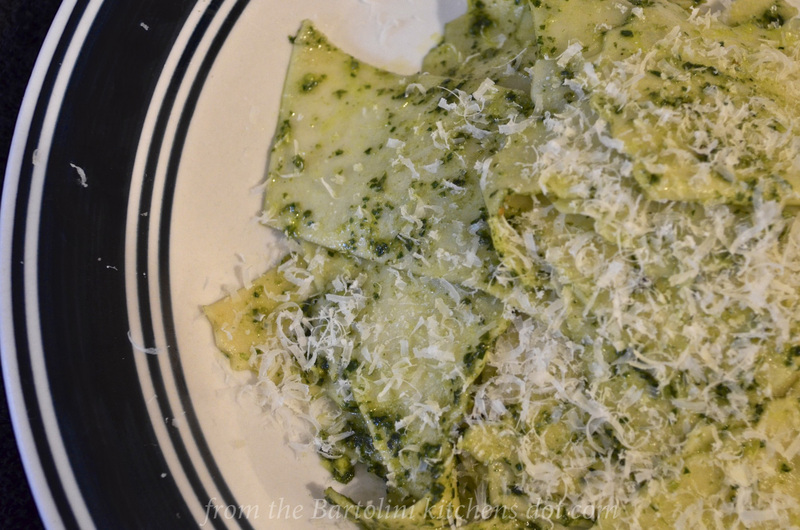 Today’s post will only detail how to make asparagus ravioli filling. 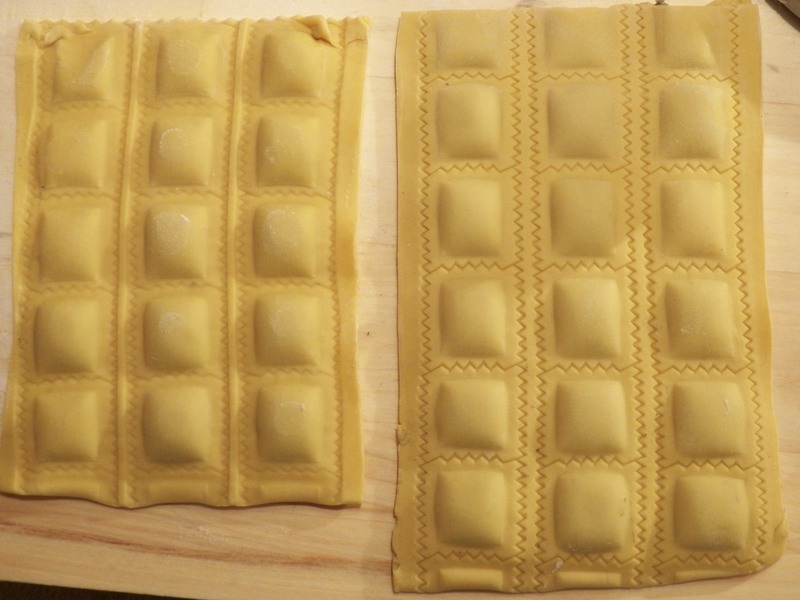 If you’re interested in seeing how to use ravioli molds/dies to create the stuffed pasta pillows, you can see step-by-step instructions by clicking HERE. For serving suggestions, see Notes below. Heat olive oil and butter over med-high heat. Add asparagus, mushroom, and onion, lower heat to medium, and sauté until mixture just begins to change color — about 6 or 7 minutes. Add garlic, salt, and pepper, and continue to sauté until liquids are gone. Do not allow to burn. Remove from heat and allow to cool fully before proceeding. 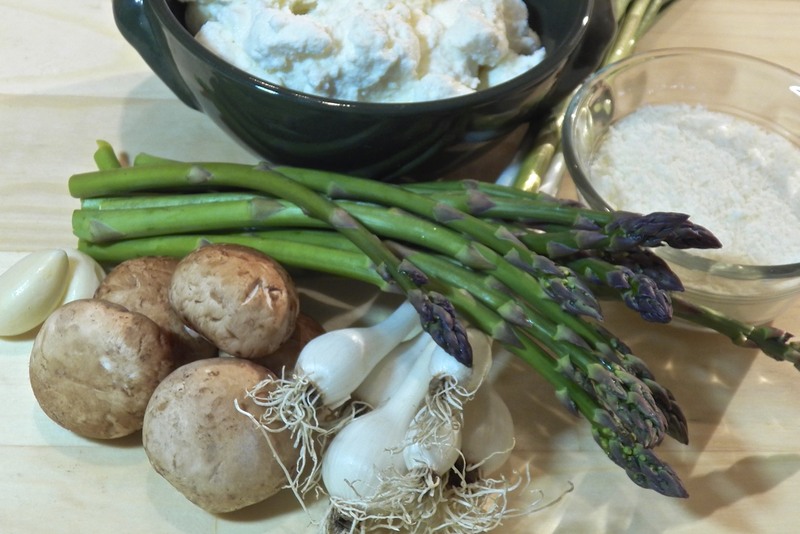 Place the asparagus mixture into the processor, add the ricotta and Romano cheeses, and process until uniformly smooth. Chop the asparagus mixture as finely as possible. Add the cheeses and stir to thoroughly combine. Filling may now be used with your favorite stuffed pasta recipe. Using this recipe and my large, 2 inch (5 cm), ravioli die/mold , I made 90 ravioli. You might make more or less, depending upon the size of the die or stamp used. Whether you use homemade or store-bought ricotta, place the cheese in a clean coffee filter, where it can drain for at least a few hours to remove the excess liquid. The drier the better. You can serve your asparagus ravioli in a number of ways. I’ve found that a brown butter and sage sauce works very well, as do cream and “light” tomato sauces. For those who really enjoy asparagus, simply sauté a few chopped asparagus spears in butter and use that to dress freshly cooked ravioli. A bit of lemon zest on top works very well. In all the examples given, grated cheese should be sprinkled atop the dressed ravioli. I’ve made this and a couple other ravioli fillings over the course of the past couple of months and it gave me an opportunity to experiment with a few things. All Purpose V Double 0 Flour. Last Fall I, finally, located a source for “00” flour, doppio 0. This is the finely ground durum flour used to make pasta and pizza dough in Italy. Although it’s roughly twice as expensive as AP flour, both Zia and I agree that using it creates pasta dough with a great feel. When cooked al dente, the pasta has a good bite, just as it should, and I’ll continue to buy and use it. Decisions have consequences, however, and I now have yet another container of flour in my kitchen. For those keeping track, that makes 6 — AP, bread, wheat, spelt, semolina, and now 00. Attachment V Ravioli Die/Mold. I decided to pull out the KitchenAid ravioli maker and give it another shot. In the past I’ve found it less than perfect and, frankly, more trouble than it’s worth. All along, I thought that the fault may lie with the fillings I used, that the attachment would work best if a softer filling was in the hopper. Today’s asparagus ravioli filling was used to test my theory. I must admit that the ravioli maker worked better than it ever has and waste — which was a big problem with earlier trials — was minimal. 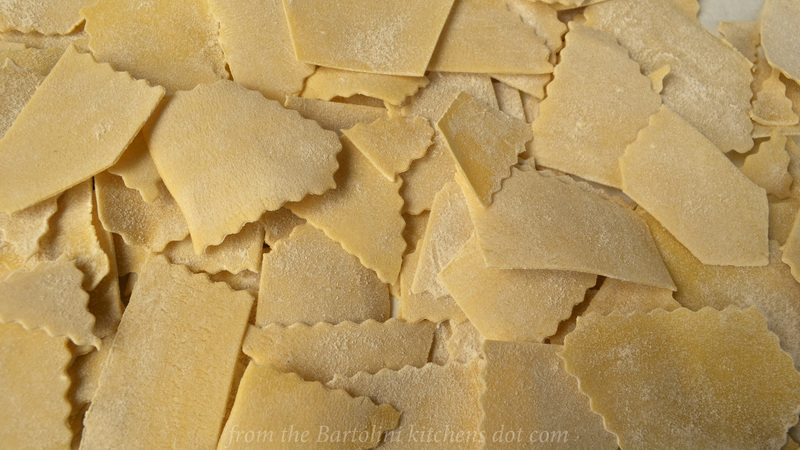 Even if a bit cumbersome to operate, probably due to my inexperience, it did produce row after row of perfect ravioli. All’s not well, though. 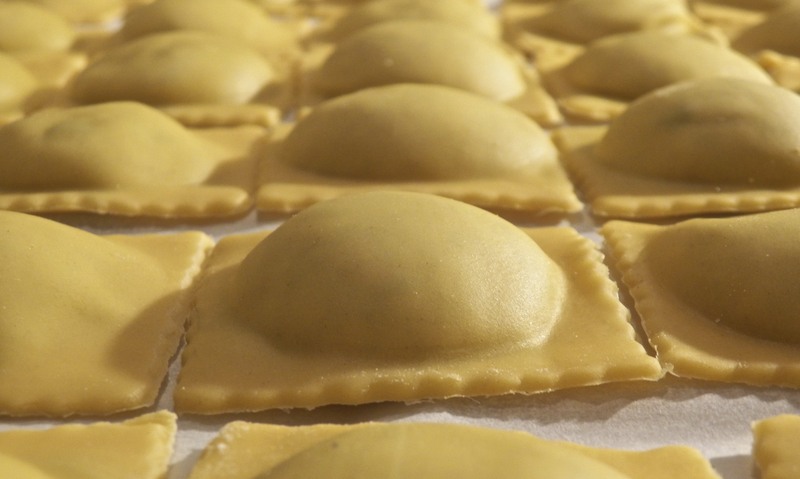 In order to get perfect ravioli, the dough sheets must be thick, more than double the thickness that we normally would use. That means you need to make at least twice the amount of pasta dough than would normally be required when using ravioli molds/dies. It, also, means the ratio of filling to pasta is different from the ravioli to which I’m accustomed. (Yes, my generation of Bartolini are a spoiled lot.) 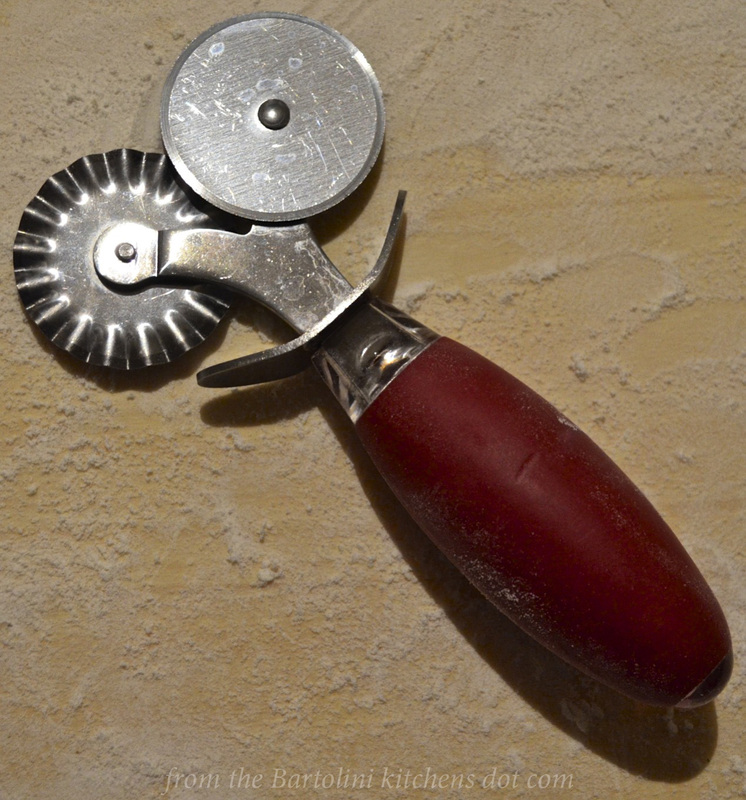 In short, the ravioli attachment is back on the shelf, waiting for me to give it another go, probably in 2015 sometime. 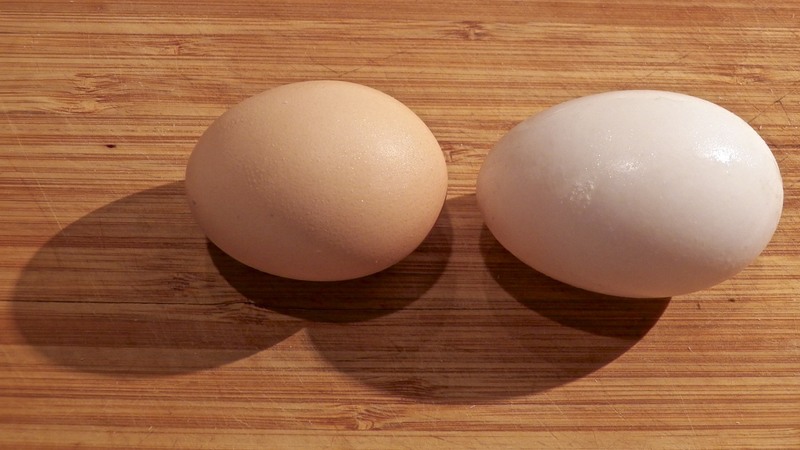 Chicken V Duck Eggs. Recently, while waiting to buy eggs at the farmers market, the customer before me bought a half-dozen duck eggs. Prior to this, I thought they were only sold by the dozen. So, I 86’ed the chicken and went duck. 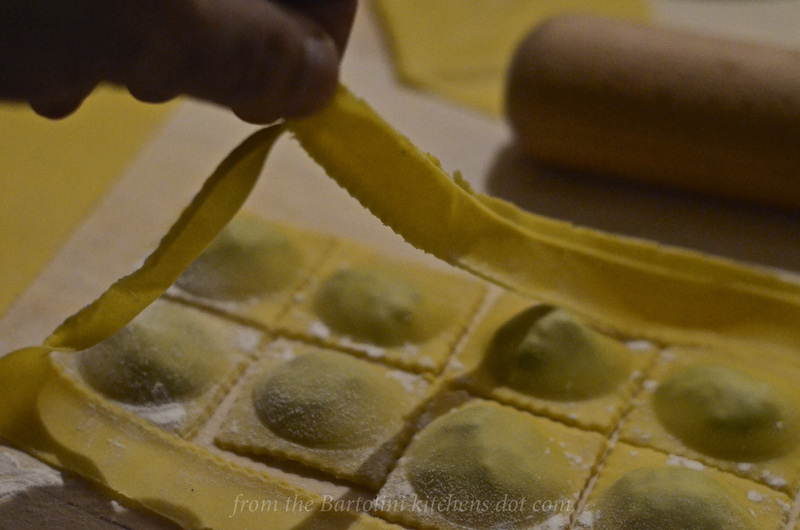 A couple of days later, I used them to make the pasta dough used in the ravioli pictured throughout this post. For those unfamiliar, Mom’s pasta dough recipe calls for 4 eggs and enough water to make a cup of liquid. Because they’re larger, only 3 duck eggs plus less than a tbsp of water will yield the required cup of liquid. Once made, the dough was much more yellow than normal but, to be fair, that may be due to the eggs’ freshness more than anything else. As for taste, I really could not detect a difference but, then again, without side-by-side taste tests, I should really say that I don’t “remember” a difference. Given that duck eggs are twice the price of chicken eggs, I’m not sure that I’ll be a regular customer for them anytime soon. As was mentioned, we’re just about at the end of asparagus season here in the Chicago area. The tables upon tables of the tasty spears have been replaced — by strawberries! 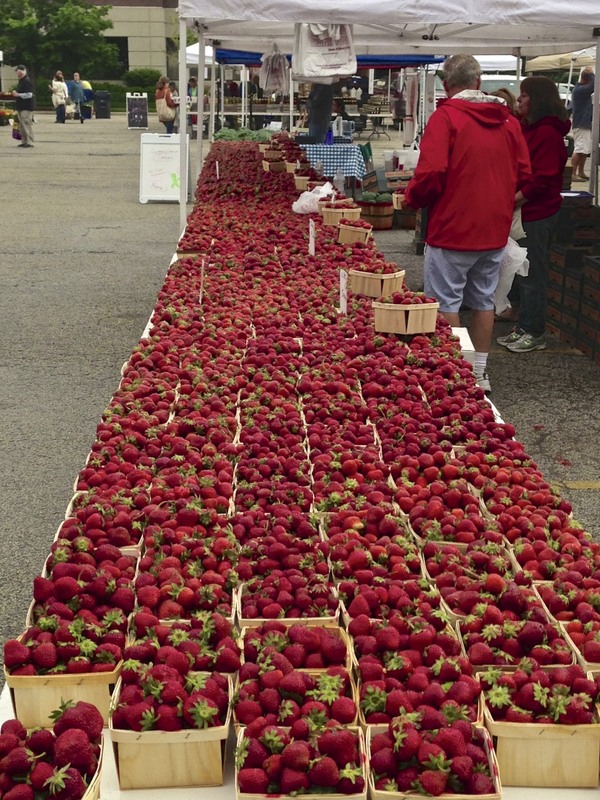 Pictured on the right is just one vendor’s berries at the Evanston farmers market. Believe me, there are many more and I defy anyone, save those with allergies, to walk around that market without buying at least one quart. 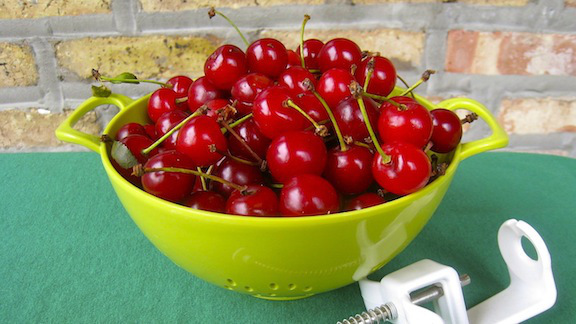 So, what will you do with these sweet & juicy red gems? 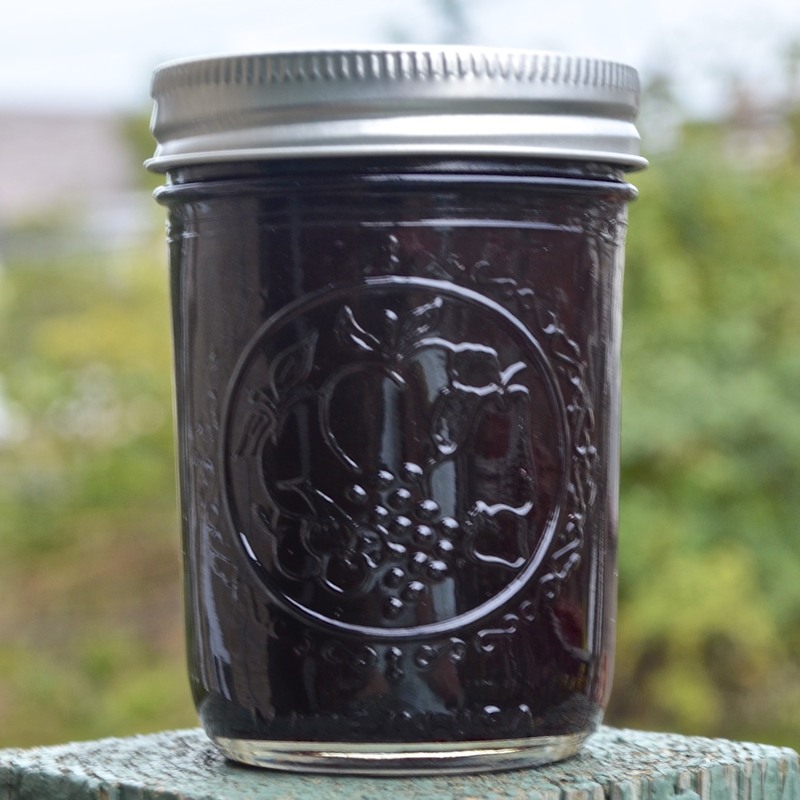 Why, make strawberry jam, of course! You can see Mom’s recipe by clicking HERE. You may be wondering, with it cold and damp when it wasn’t flat-out raining, what does one do in rural Michigan? Well, I can’t speak for others but we cooked … and we cooked … and we cooked again. True, I did take my daily walk looking for morel mushrooms and ramps but returned home empty-handed each time. (Not to worry, I came prepared.) So, with several great meals prepared and, as the title suggests, devoured, I thought I’d share a couple of the recipes today, with a promise to post the rest in the weeks to come. I can count on two things whenever I arrive at Zia’s home. Once I’ve unpacked the car, there will be a Manhattan waiting for me. (Zia is the original “Hostess with the Mostest”.) With my thirst quaffed, Zia will then get to work on the traditional Bartolini risotto. 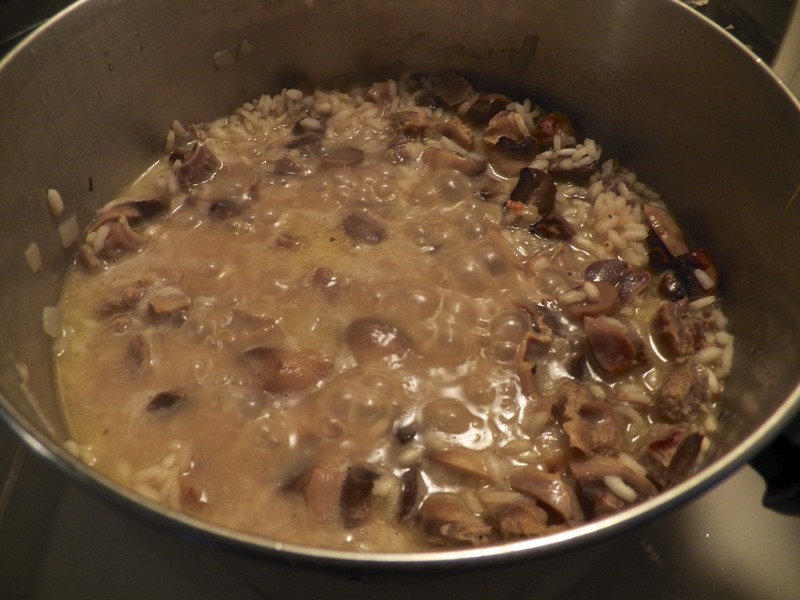 Made with fresh mushrooms and chicken gizzards, this dish has long been a family favorite. 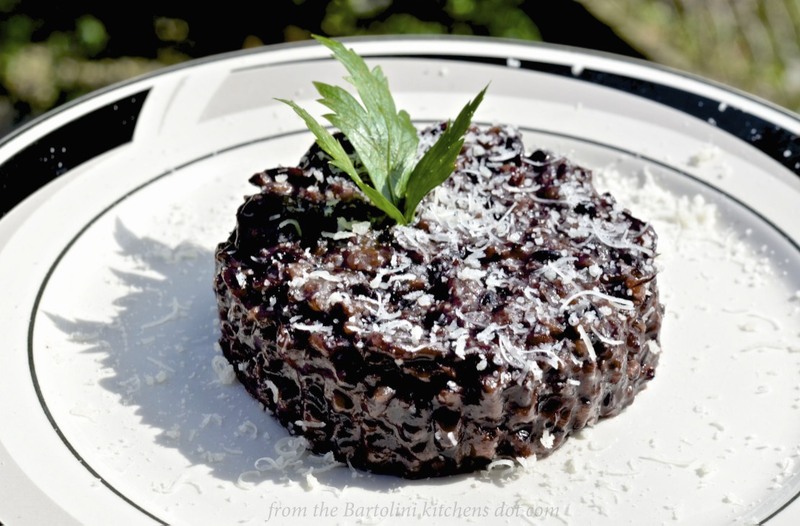 In fact, there were relatives that traveled hundreds of miles and, upon each and every arrival, asked for a risotto dinner. Of course, not everyone likes chicken gizzards, so, just tell them that the offending bits are nothing but a few dried mushrooms. More about that, and the risotto recipe, will be shared in a future post. Although most lunches were simple sandwiches made with the Italian lunch meats and bread I brought with me, there were 2 notable exceptions. On Sunday, like always, we had brunch after Mass with a few of Zia’s neighbors and fellow choir members. (Yes, Zia is a member of her church’s choir.) 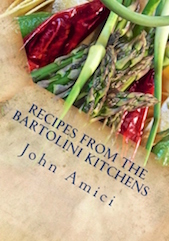 The 2nd time was when I prepared Asparagus in the style of Milan, Asparagi alla Milanese. There will be no future recipe for this dish because it is so very simple to prepare. Season fresh asparagus spears with salt, pepper, and a bit of olive oil. Place the spears on a heated barbecue, hot grill pan, or baking sheet that’s placed in a hot (425˚ F, 218˚ C) oven. Meanwhile, fry an egg or two per serving and season with salt & pepper. If, like us, you like your yolks runny, the eggs should be prepared sunny-side up or over easy. And that’s it. 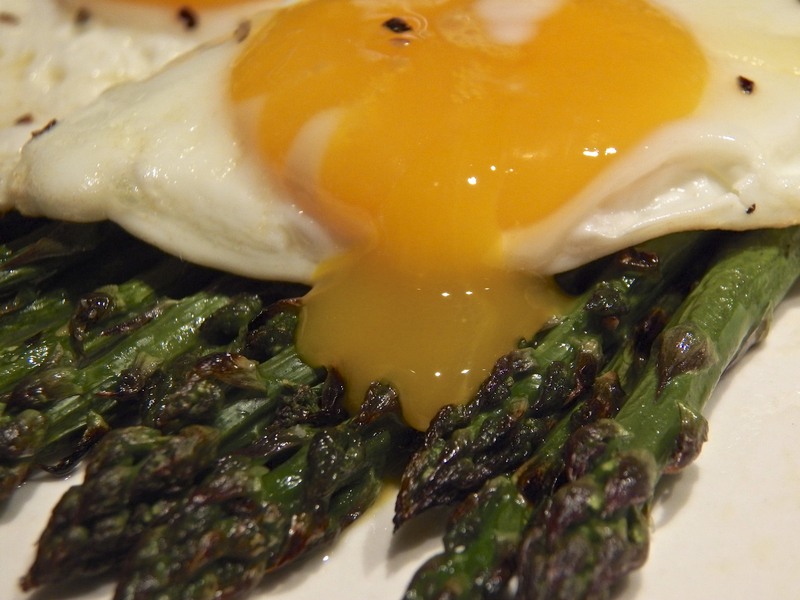 When both the asparagus and eggs are cooked to your liking, arrange a serving of asparagus spears on a dinner plate, place the eggs on top, and, if you like, garnish with a bit of grated Pecorino Romano or Parmigiano Reggiano cheese. It couldn’t be easier but it sure is a great tasting light lunch or fantastic primo piatto. Now, we just didn’t spend all of our time eating lunch. We did work for our suppers, too. In fact, Zia’s pasta board got quite a bit of use over the course of my visit. One day, we made ravioli and linguine. Using a filling of ramps, fresh spinach, and goat’s cheese, Zia and I spent the afternoon making pasta pillows. 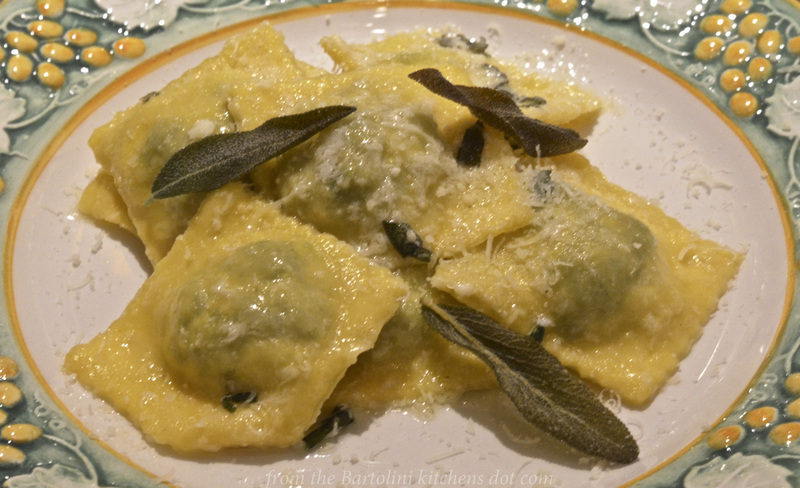 That night, we feasted on these very same ravioli, prepared with morel mushrooms in a white wine sauce. Those recipes will be coming your way. Another day brought out the pasta board again and we spent the afternoon making gnocchi. That night’s dinner was probably the best of my entire visit. Our primo piatto was gnocchi dressed in a rich gorgonzola cream sauce. That night’s secondo was grilled rack of Spring lamb, while contorni of grilled asparagus and a tossed salad rounded out the meal. Later that night, I surprised Zia with cannoli that I’d brought from my Italian market. 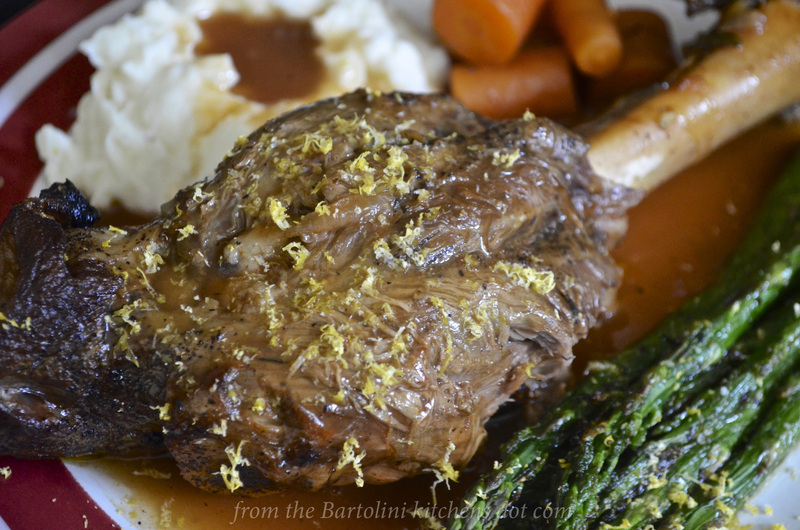 Recipes for the gnocchi, gorgonzola cream sauce, and lamb will soon be posted, too. Lastly, I could hardly go home for a visit without bringing something from the fish monger. This visit I brought whiting, merluzzo, with me. Rather than risk ruining them on a grill with which I’ve had little experience, these little fishies were prepared with the Bartolini breading mixture and baked, with excess breading mixture placed on the baking sheet, roasted, and used to garnish a platter of hand-cut linguine aglio e olio with baby artichokes, spinach, and ramps. The merluzzo recipe was already shared HERE. To make the pasta dish, place 1/3 cup olive oil in a hot pan over med-high heat. Add red pepper flakes, to taste, along with chopped ramps. Sauté till ramps are soft, add 2 to 4 bulbs of diced Spring or new garlic, and continue cooking for another minute. 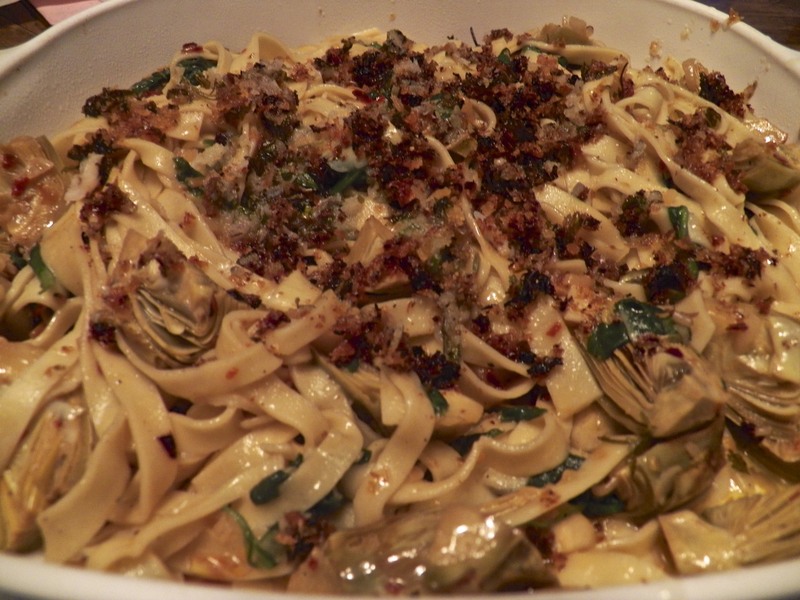 Add the trimmed and quartered fresh artichokes, a half cup of white wine, bring to a boil, and reduce to a soft simmer. Allow the artichokes to braise until soft and the sauce has reduced, about 15 minutes. Meanwhile, cook pasta until two minutes shy of package directions or, if using fresh, until the pasta is a bit firmer to the bite than your prefer. Reserve a cup of the pasta water, drain the pasta, and add to the frying pan along with a handful or two of fresh spinach. Toss to coat the pasta and continue to sauté the pan’s contents until the pasta is cooked to your liking, adding pasta water as needed to maintain the sauce. 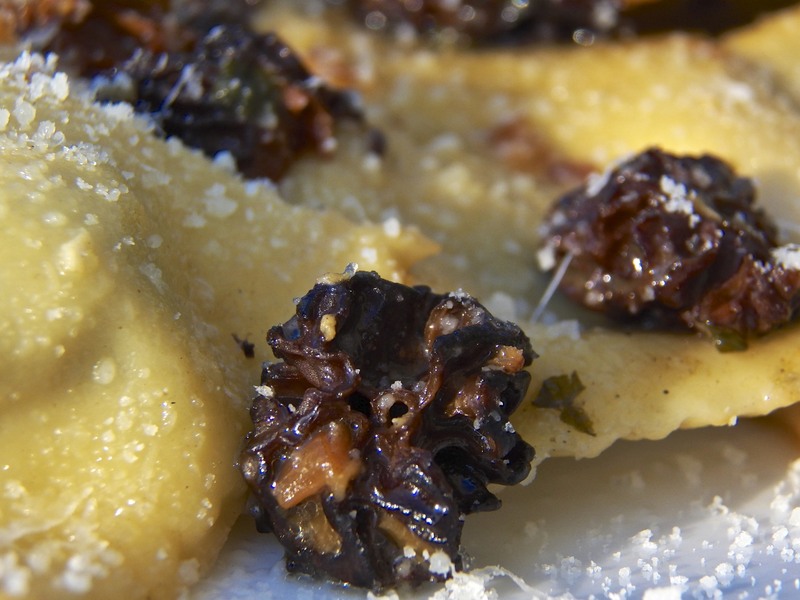 To serve, garnish with breading mixture that remains on the baking sheet that was used to roast the merluzzo. 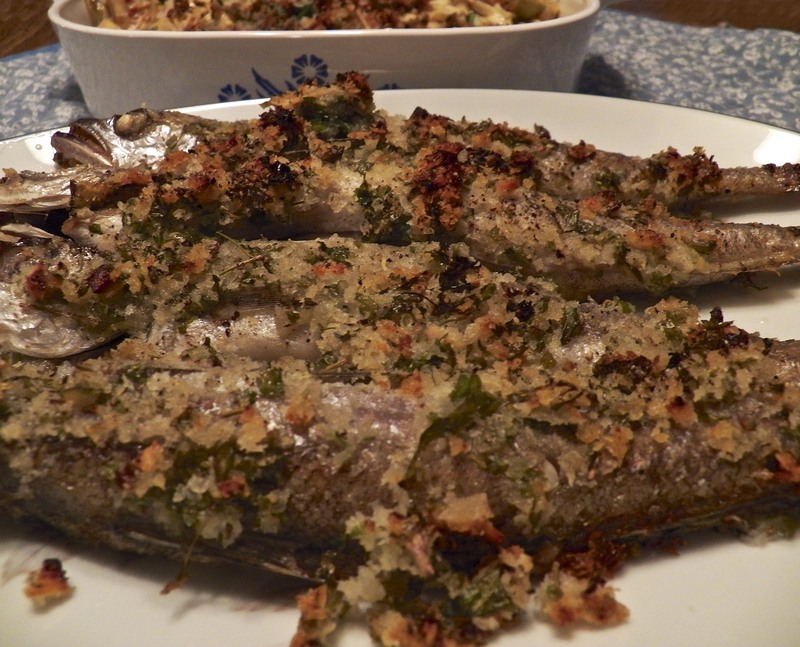 Of course, if merluzzo isn’t on that night’s menu, your pasta may be garnished with grated cheese or bread crumbs toasted in a bit of olive oil. So, there you have it. We cooked, we chatted, we worked out the kinks in a recipe or two, and we spent a very nice time together. And, best of all, there are recipes to share for anyone that’s interested. Would that I could end this post here and now but, alas, there’s a bit more to tell. Late on the night of my arrival in Michigan, I received a telephone call telling me of some storm damage at my home. Thankfully no one was hurt and there wasn’t any structural damage. Since a picture is worth a thousand words and our friend Celi has challenged us all to post a view from our back porches, here’s mine. With the exception of a potted palm that died under the most suspicious of circumstances in the living room, this is about as close to indoor plumbing as Max will ever get. That green thing is not some prop from a 50’s sci-fi thriller. It’s a trumpet vine that the wind knocked down, blocking the path to the garage and alley, not to mention landing atop a few roses. (Hopefully the dog run’s fence took the brunt of the force from the falling vine.) Here’s the view from the porch landing above. Believe it or not, buried within that tangled mess are the remnants of a wooden trellis. 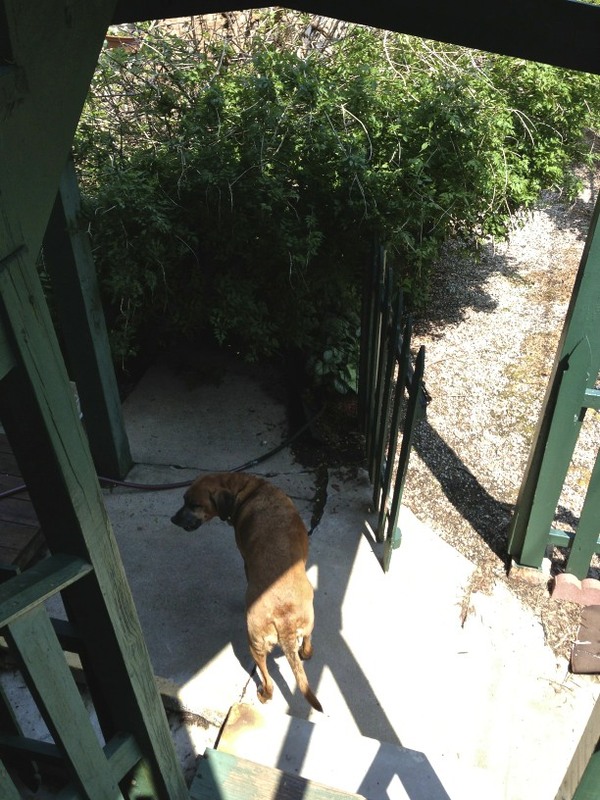 As you can see, mine is a typical city yard here in Chicago, made even smaller because of the 2 car garage and dog run … um … and the now-fallen vine. 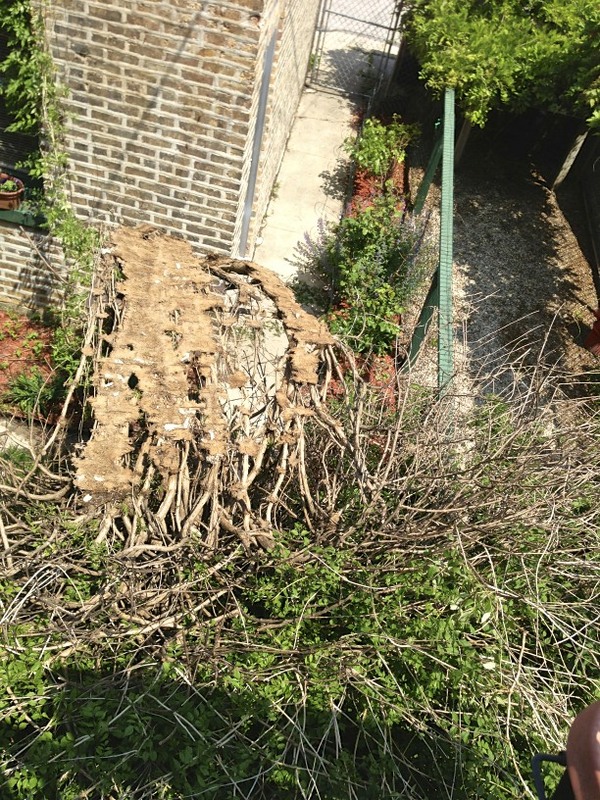 As of this writing, I’m waiting to hear from a few landscapers for bids to remove the vine and haul it away. On the plus side, once it’s removed, there’ll be space for a clematis vine and another rose. The Kitchens are open again, with a new recipe, Baked Haddock, coming this Wednesday.